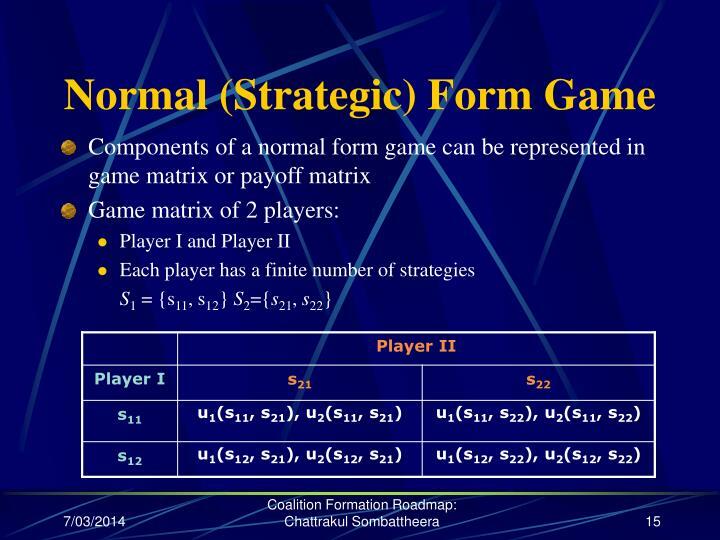 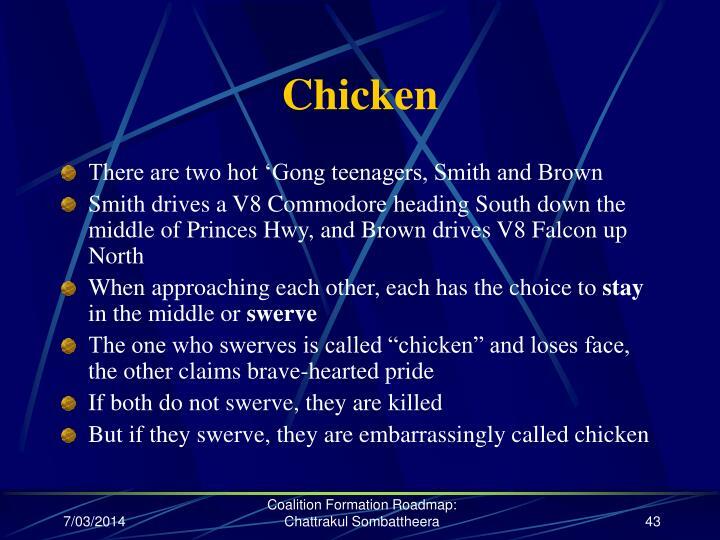 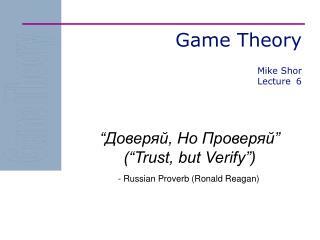 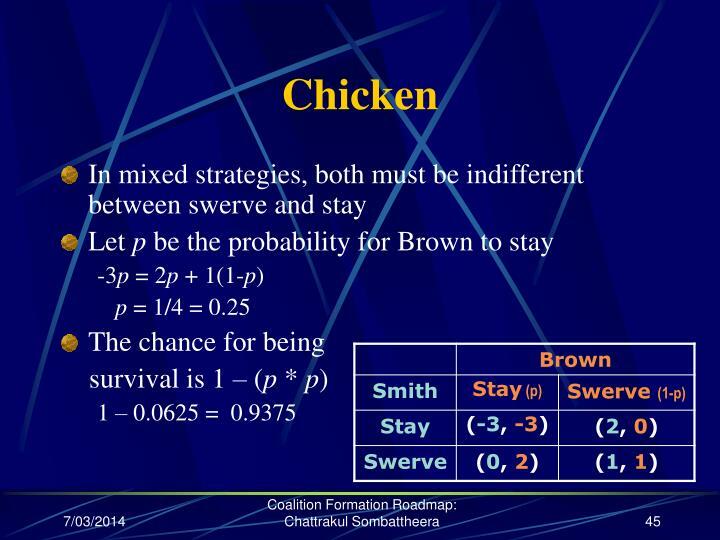 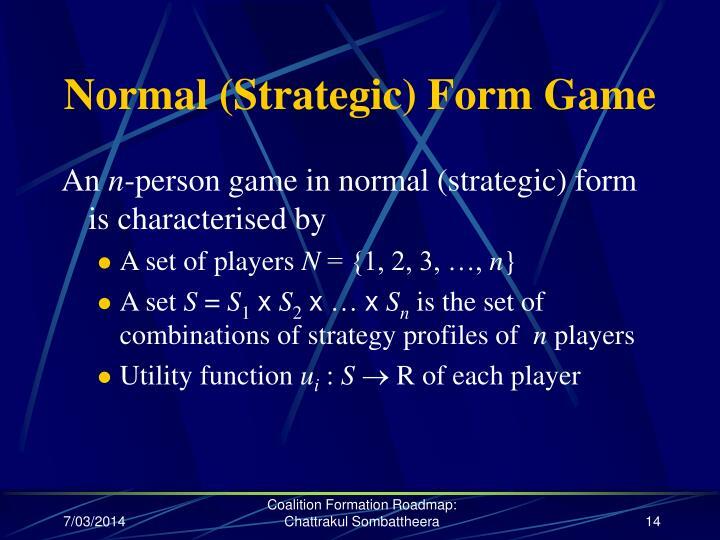 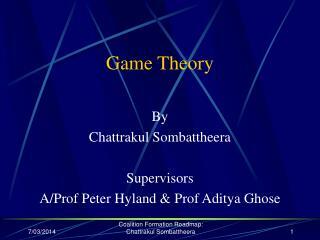 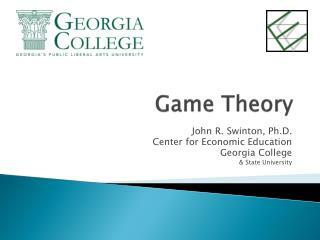 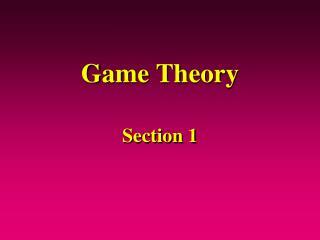 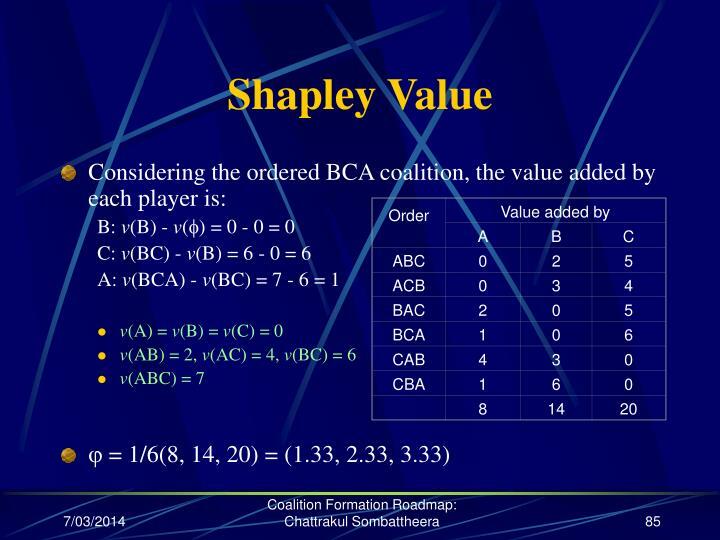 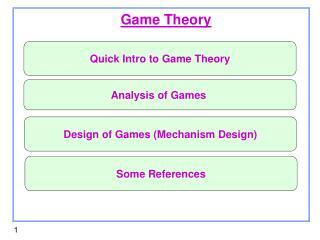 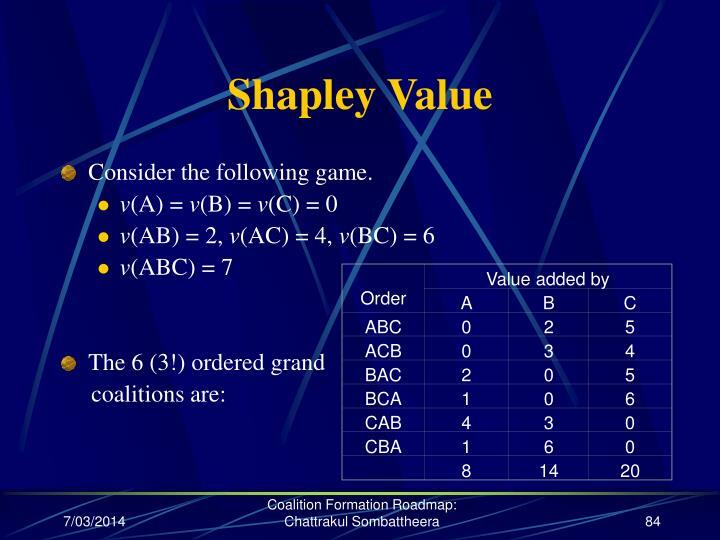 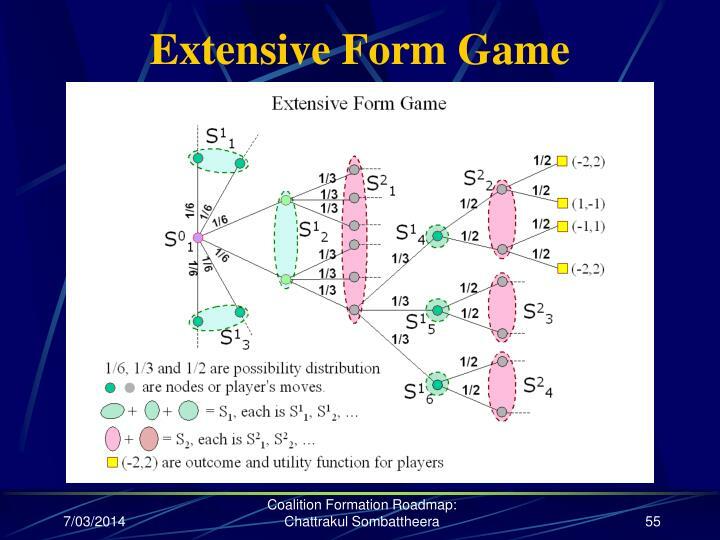 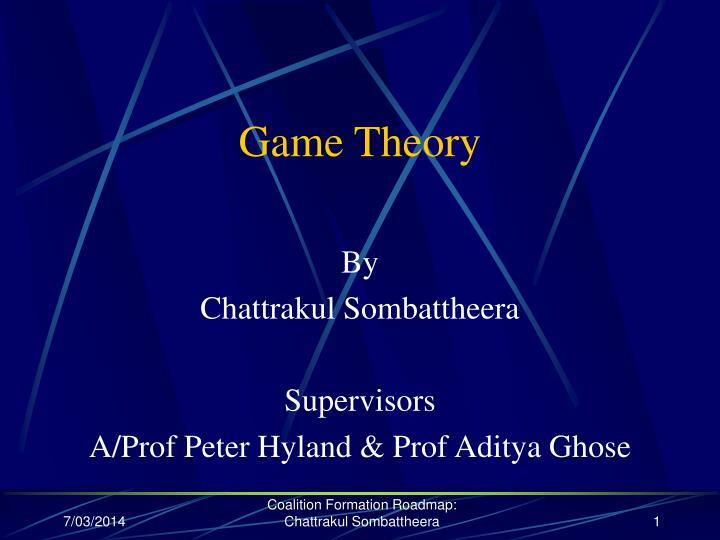 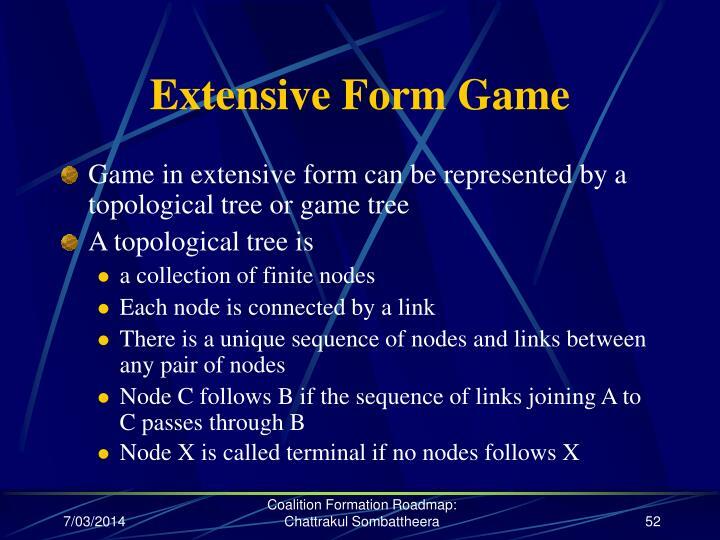 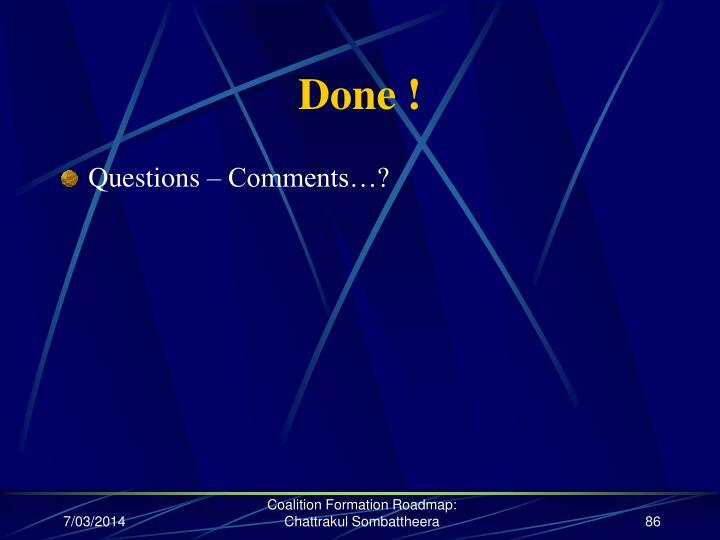 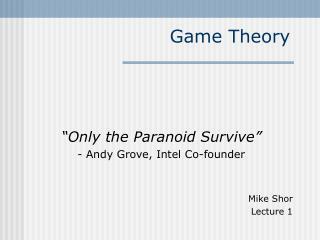 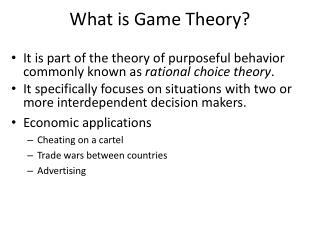 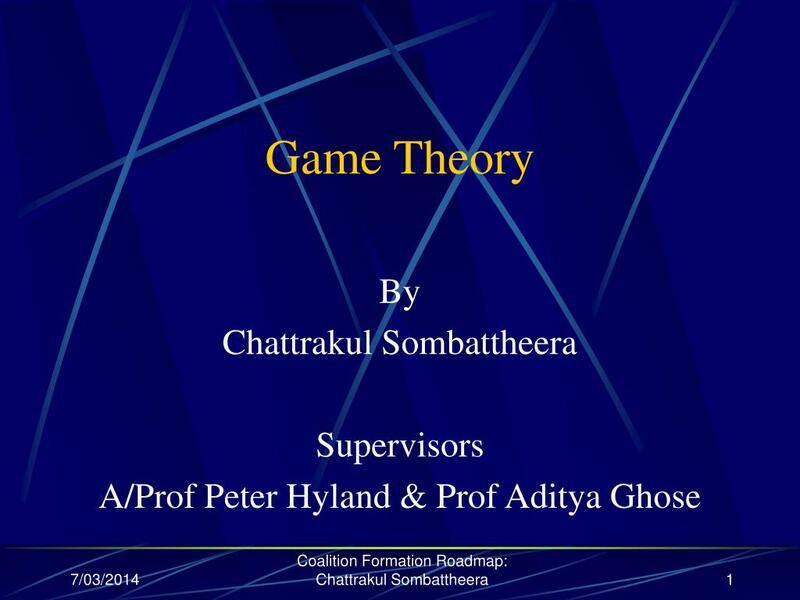 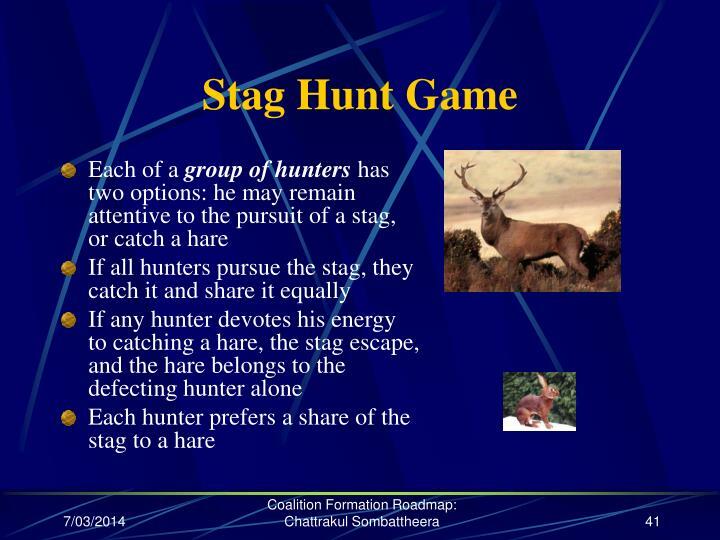 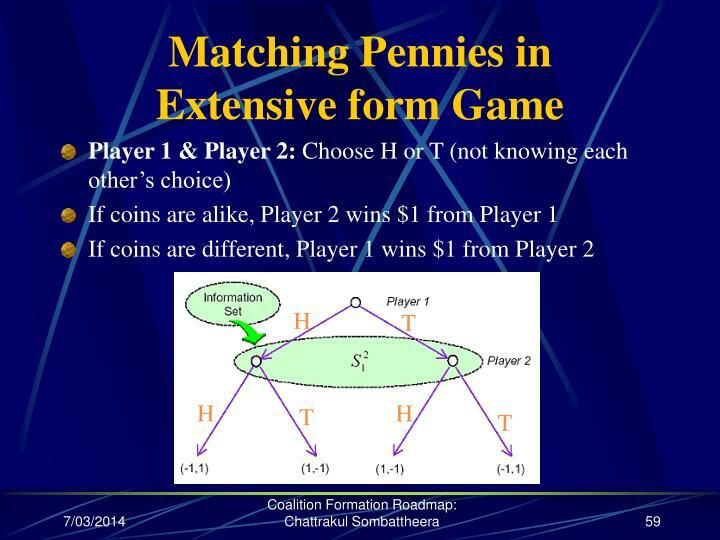 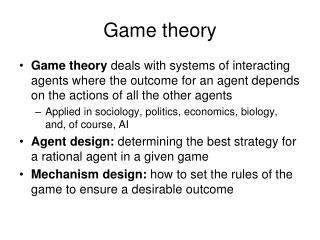 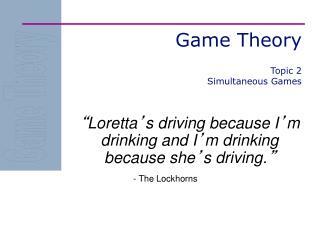 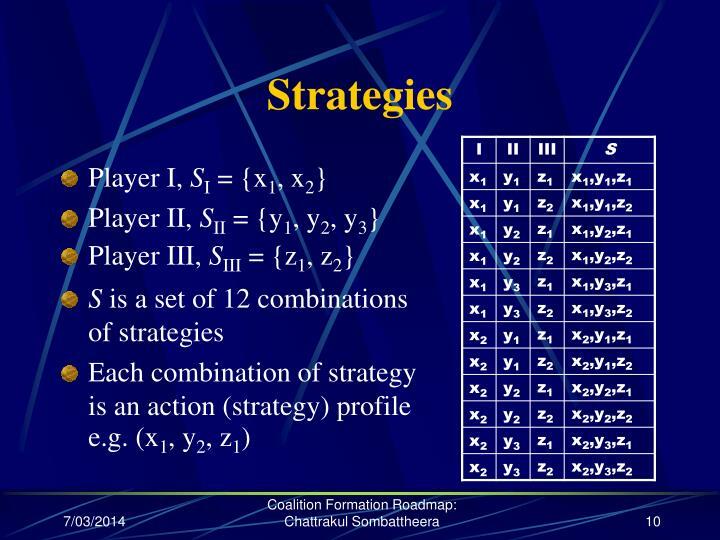 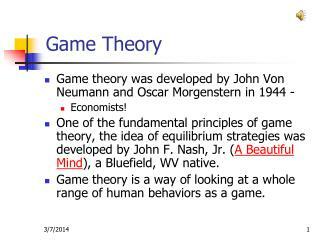 Game Theory By Chattrakul Sombattheera Supervisors A/Prof Peter Hyland & Prof Aditya Ghose Game theory Analysis of problems of conflict and cooperation among independent decision-makers. 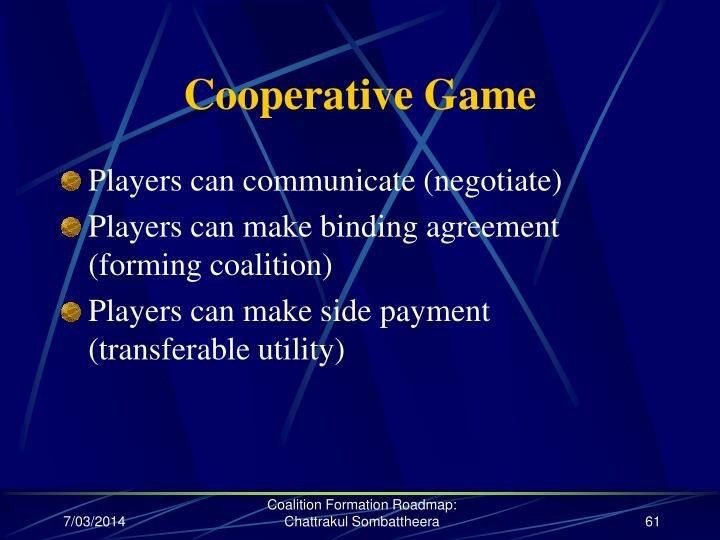 Analysis of problems of conflict and cooperation among independent decision-makers. 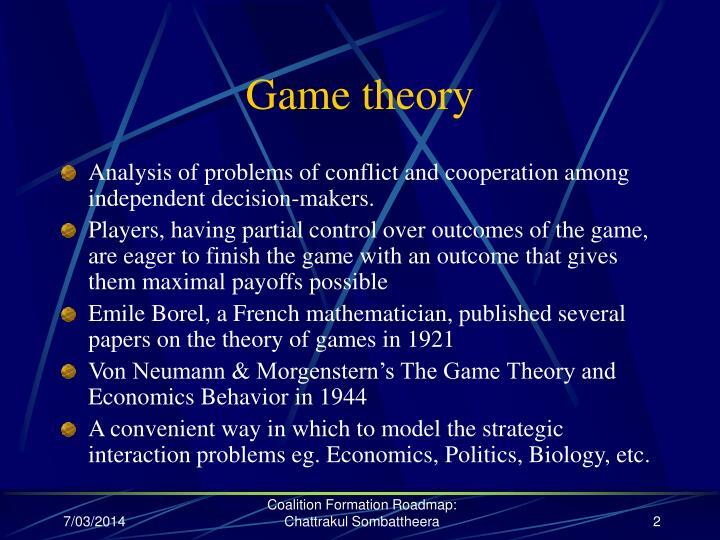 A convenient way in which to model the strategic interaction problems eg. 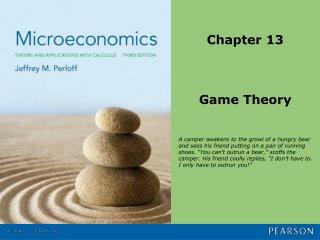 Economics, Politics, Biology, etc. 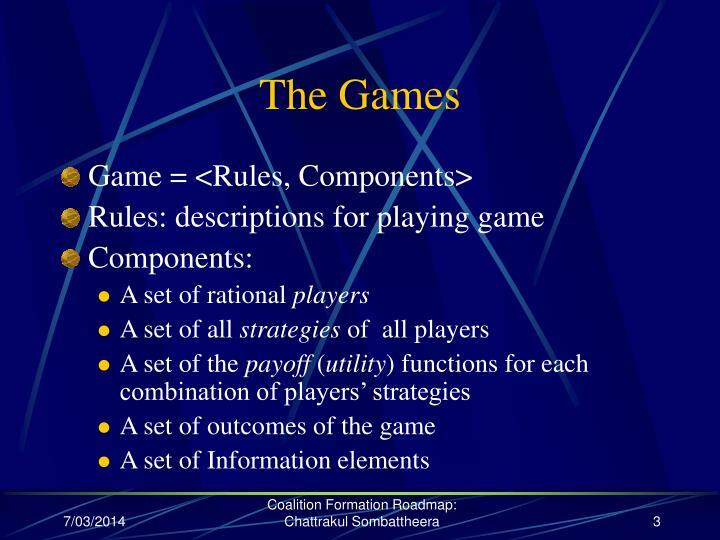 The rules give details how the game is played e.g. What they will achieve, etc. 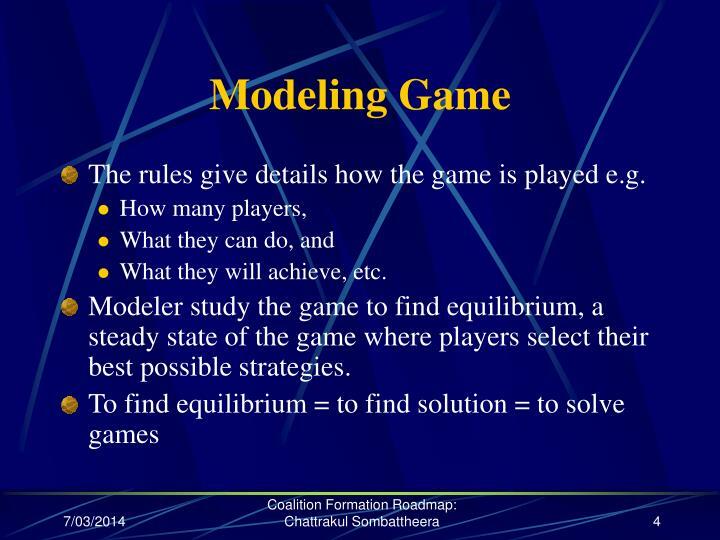 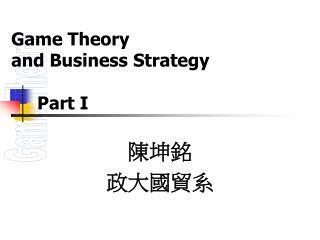 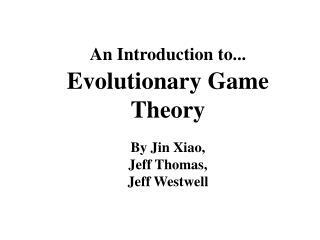 Modeler study the game to find equilibrium, a steady state of the game where players select their best possible strategies. 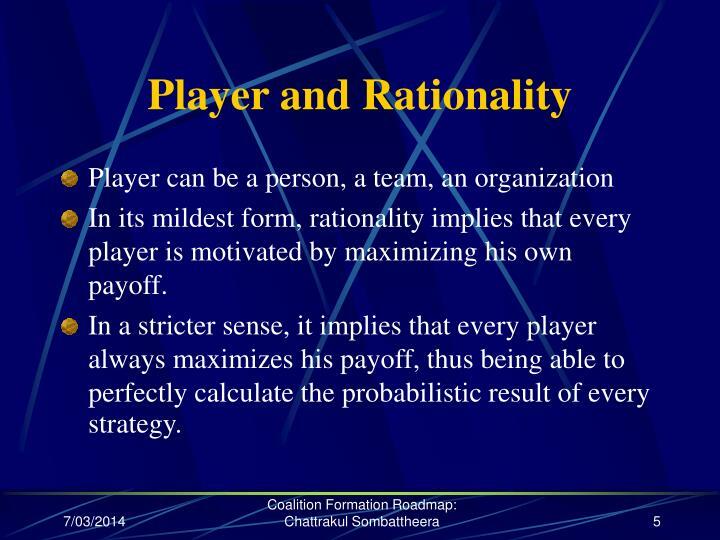 In its mildest form, rationality implies that every player is motivated by maximizing his own payoff. 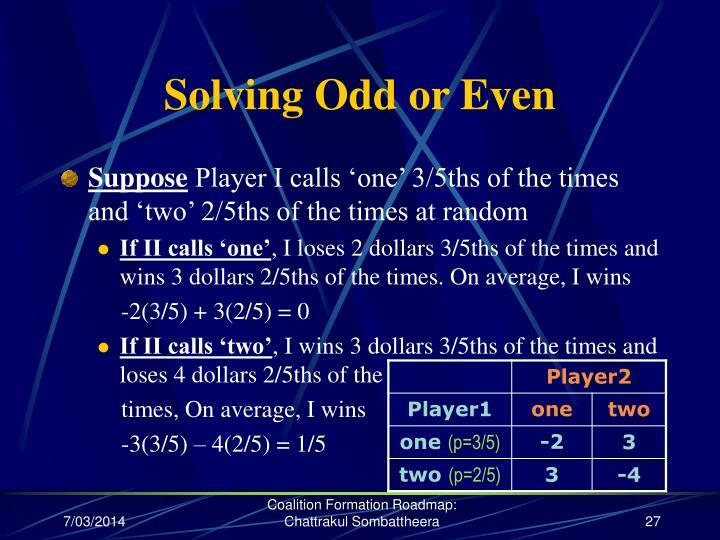 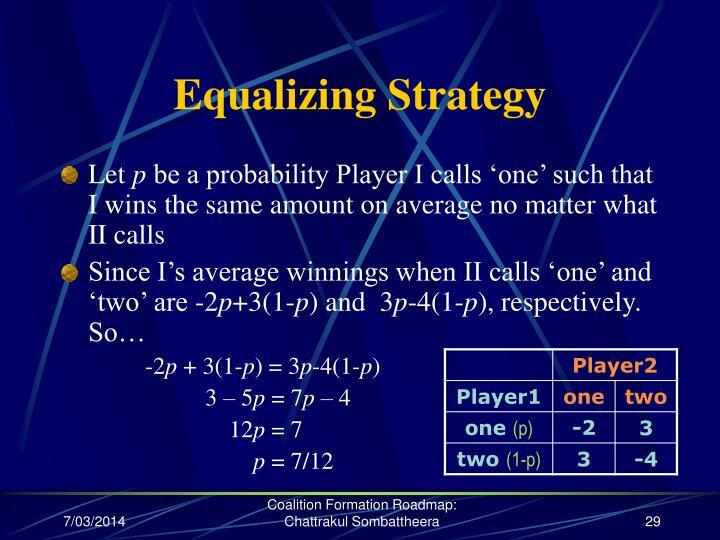 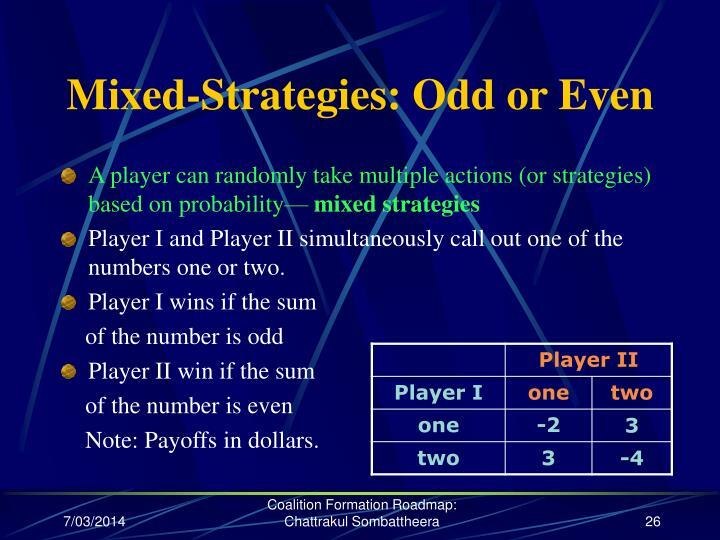 In a stricter sense, it implies that every player always maximizes his payoff, thus being able to perfectly calculate the probabilistic result of every strategy. 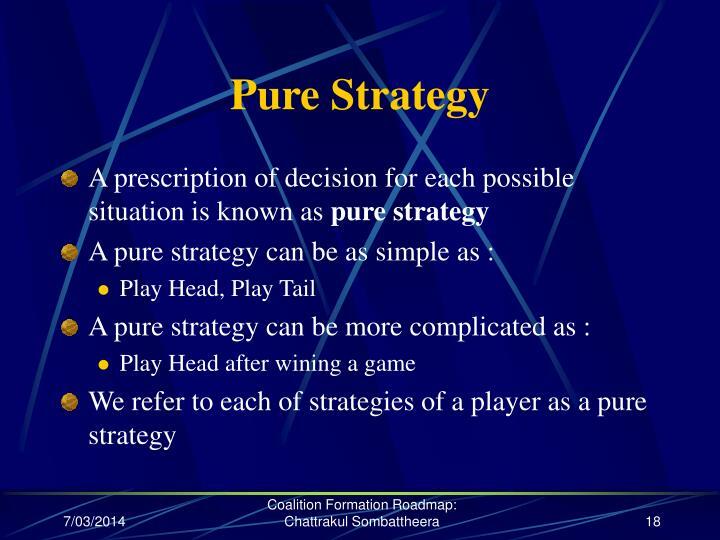 Simultaneous: All players make decisions (or select a strategy) without knowledge of the strategies that are being chosen by other players. 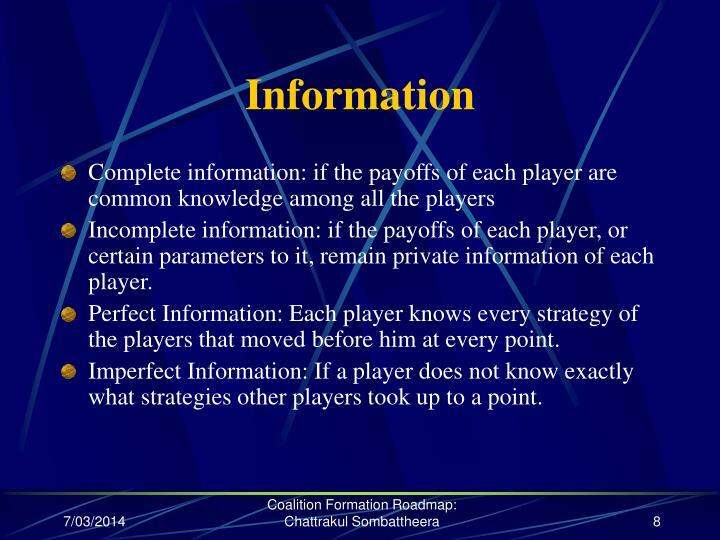 Incomplete information: if the payoffs of each player, or certain parameters to it, remain private information of each player. 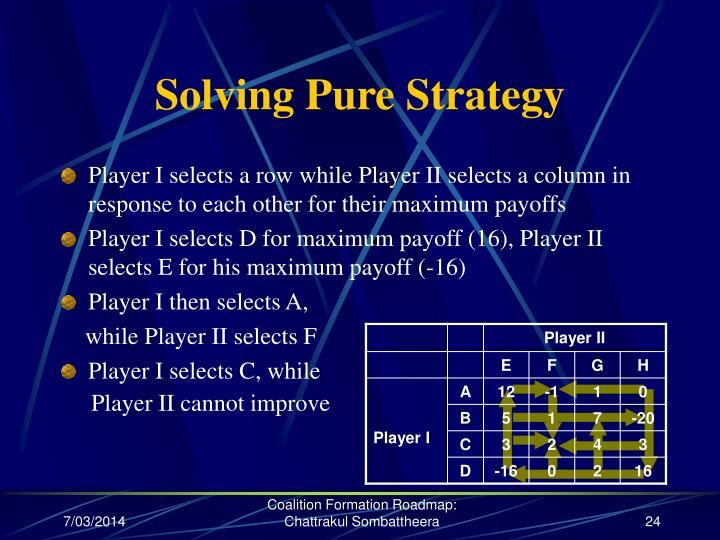 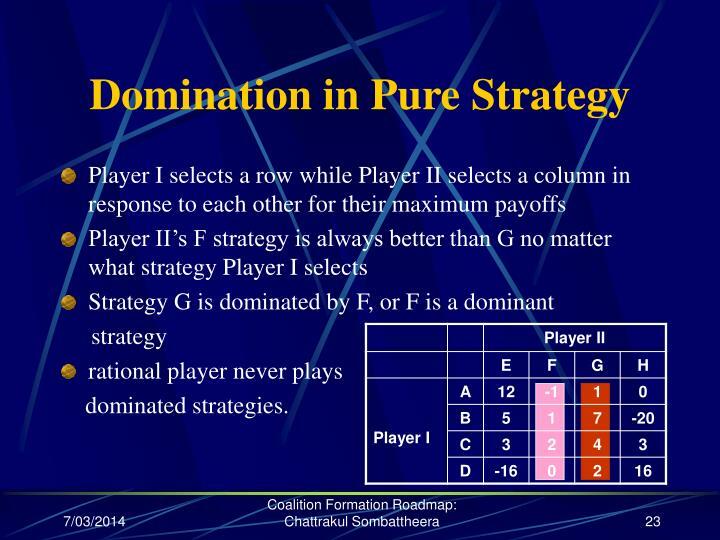 Perfect Information: Each player knows every strategy of the players that moved before him at every point. 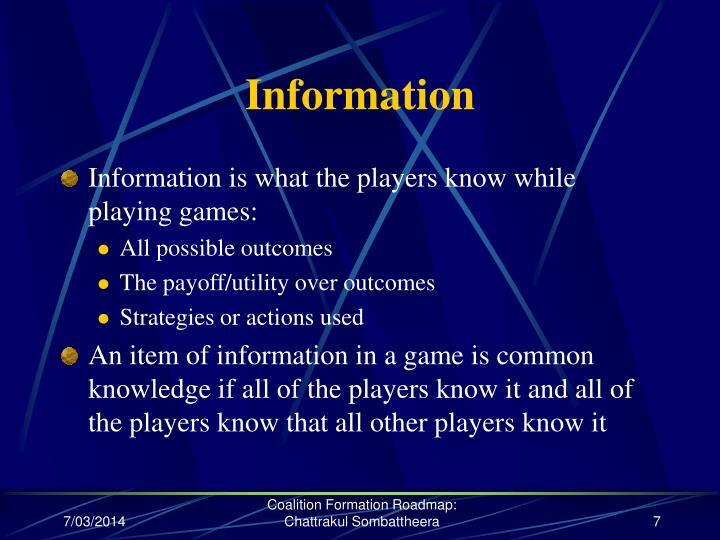 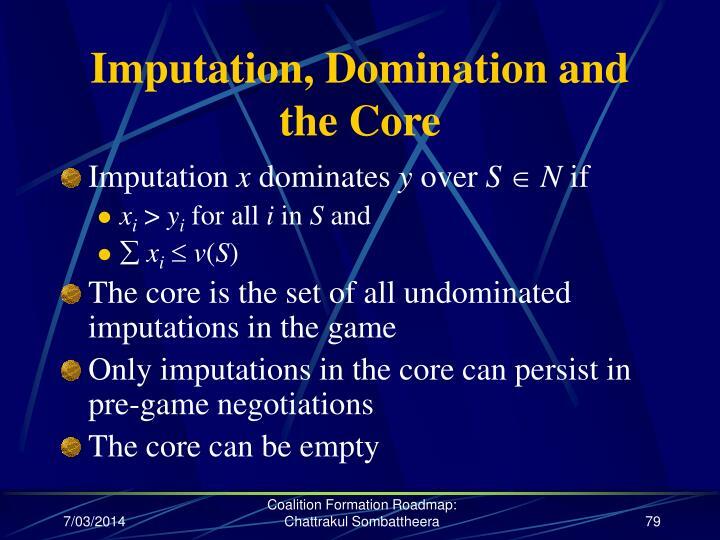 Imperfect Information: If a player does not know exactly what strategies other players took up to a point. 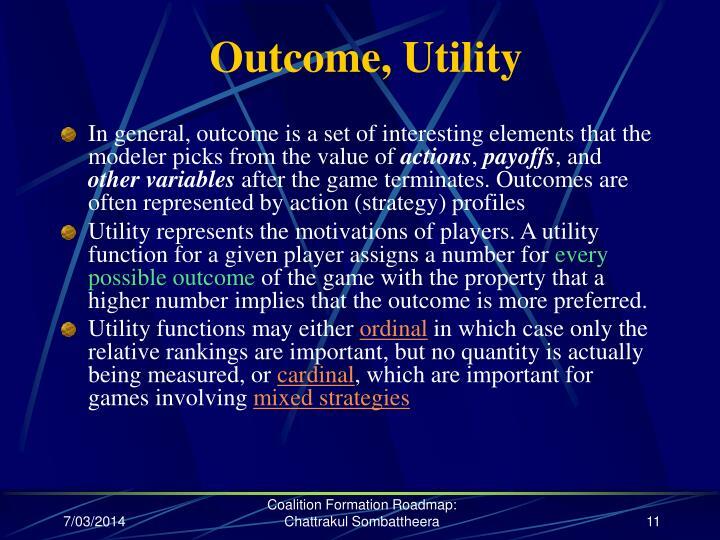 Utility represents the motivations of players. 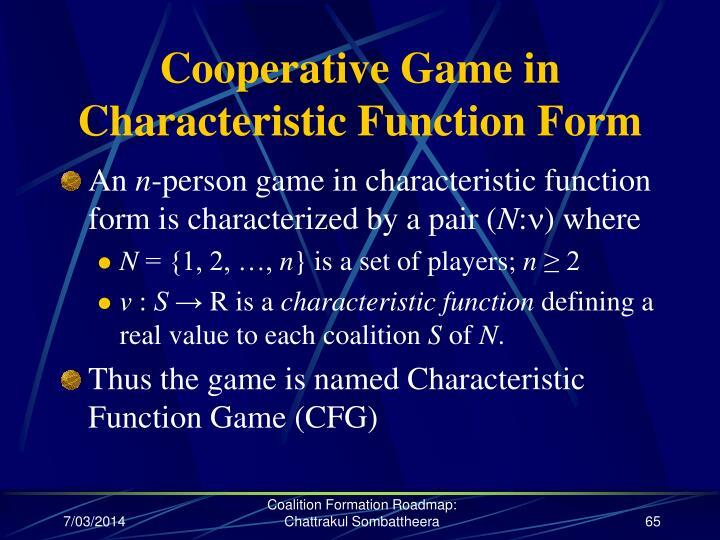 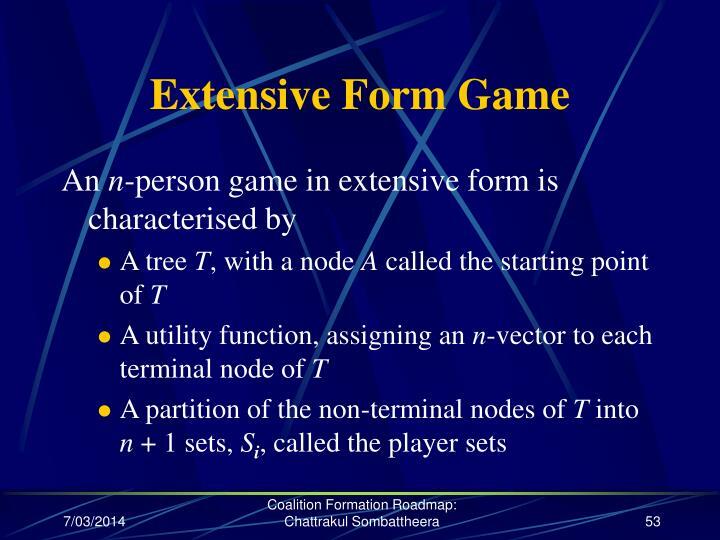 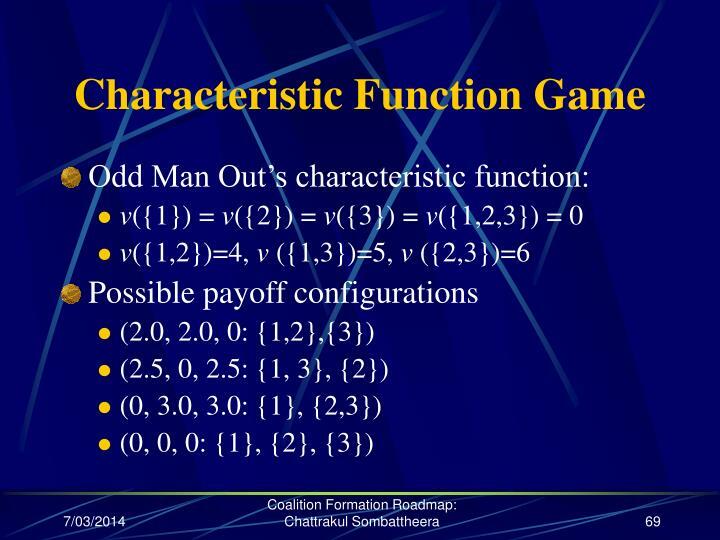 A utility function for a given player assigns a number for every possible outcome of the game with the property that a higher number implies that the outcome is more preferred. 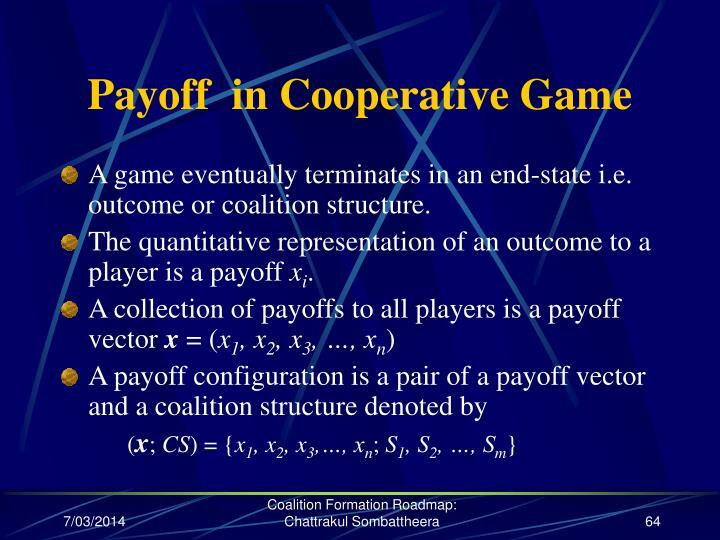 Payoffs are numbers which represent the motivations of players. 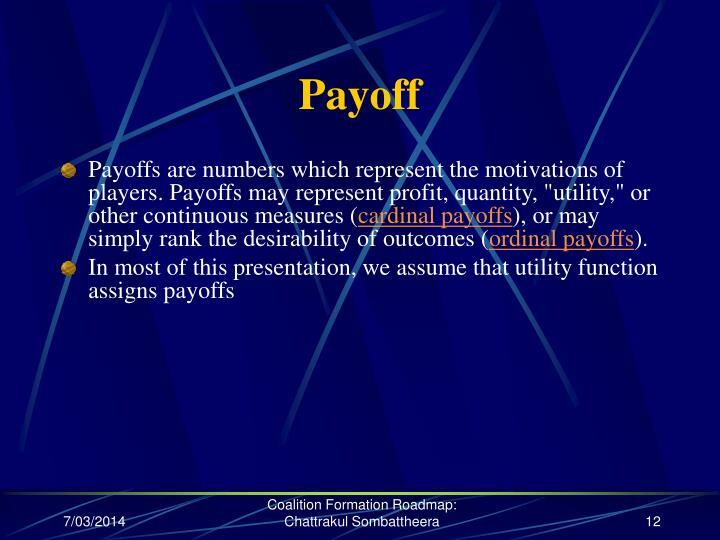 Payoffs may represent profit, quantity, "utility," or other continuous measures (cardinal payoffs), or may simply rank the desirability of outcomes (ordinal payoffs). 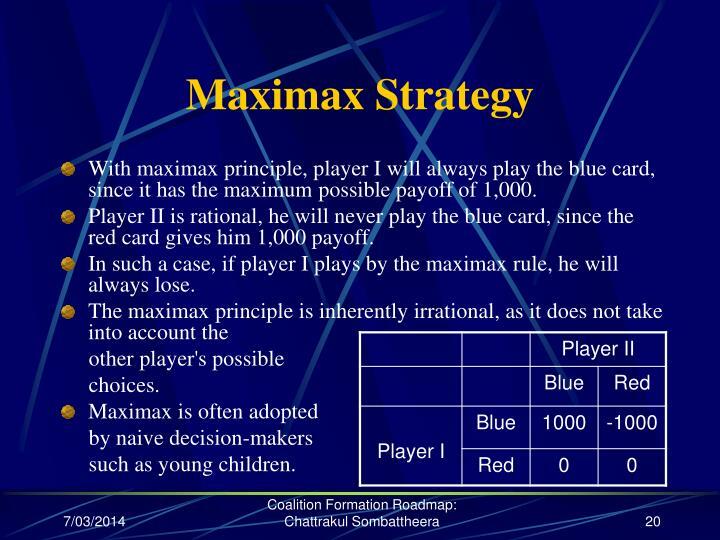 With maximax principle, player I will always play the blue card, since it has the maximum possible payoff of 1,000. 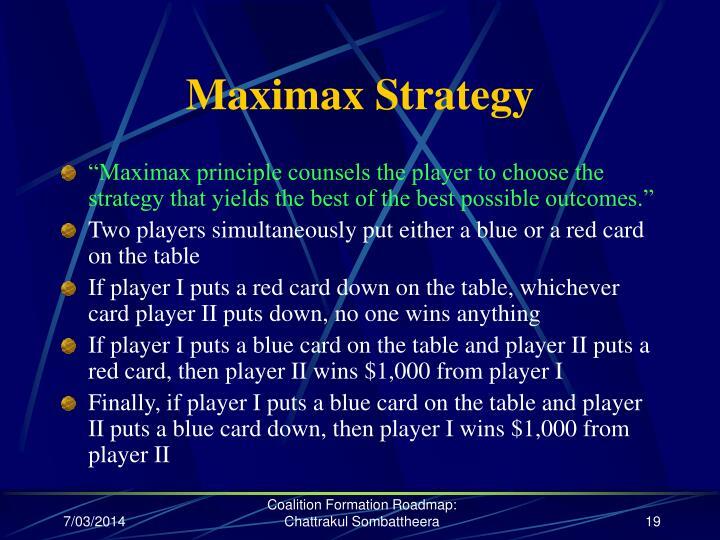 Player II is rational, he will never play the blue card, since the red card gives him 1,000 payoff. 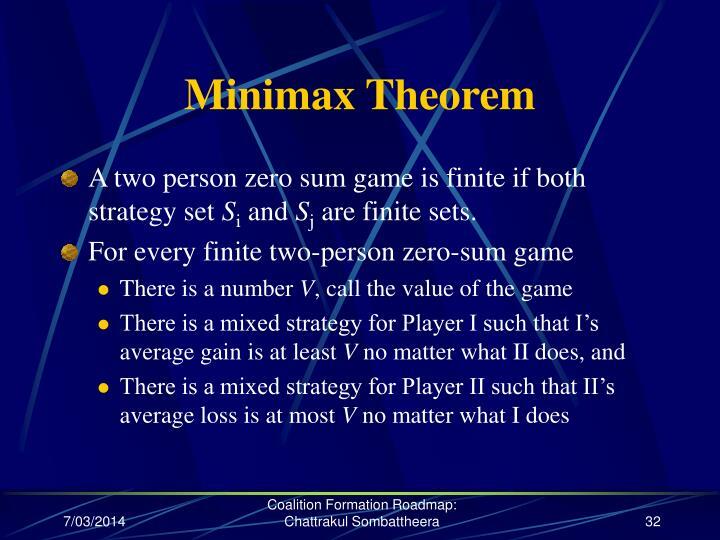 In such a case, if player I plays by the maximax rule, he will always lose. 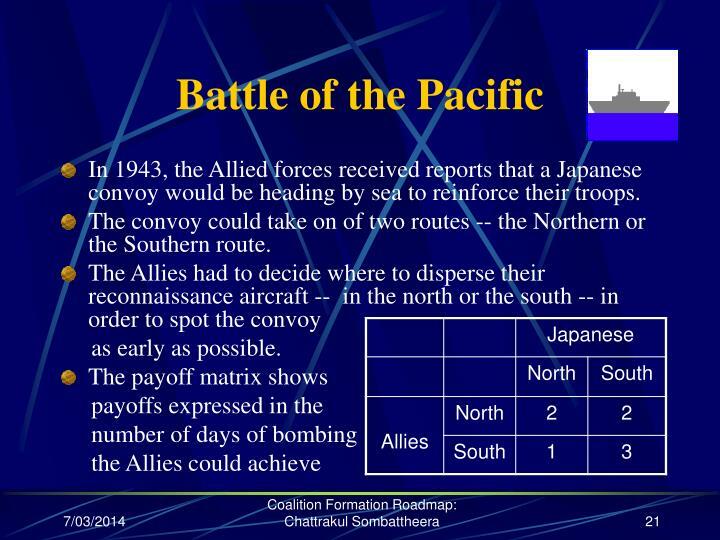 In 1943, the Allied forces received reports that a Japanese convoy would be heading by sea to reinforce their troops. The convoy could take on of two routes -- the Northern or the Southern route. 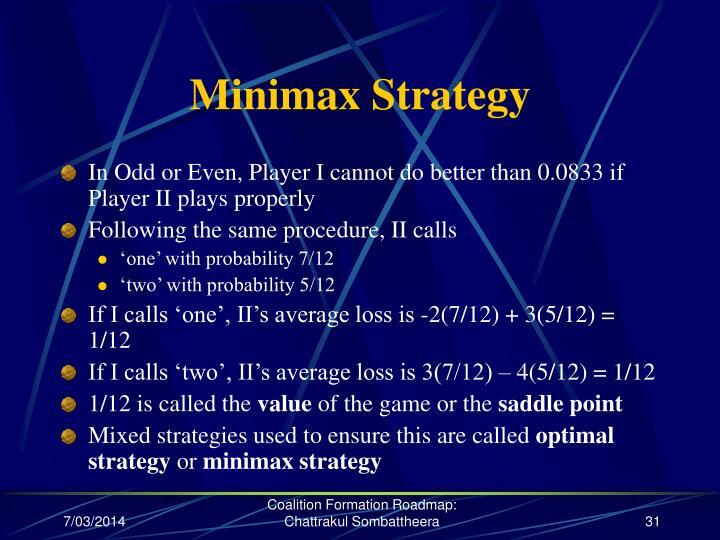 Minimax strategy is to minimize the maximum possible loss which can result from any outcome. 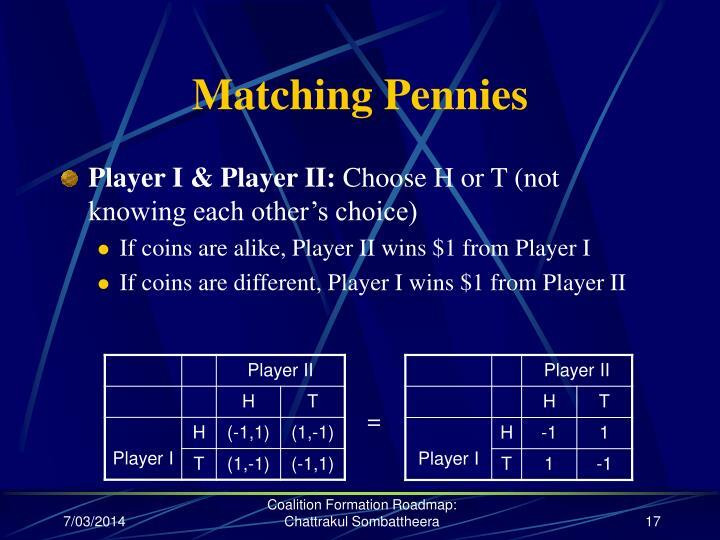 Player I and Player II simultaneously call out one of the numbers one or two. 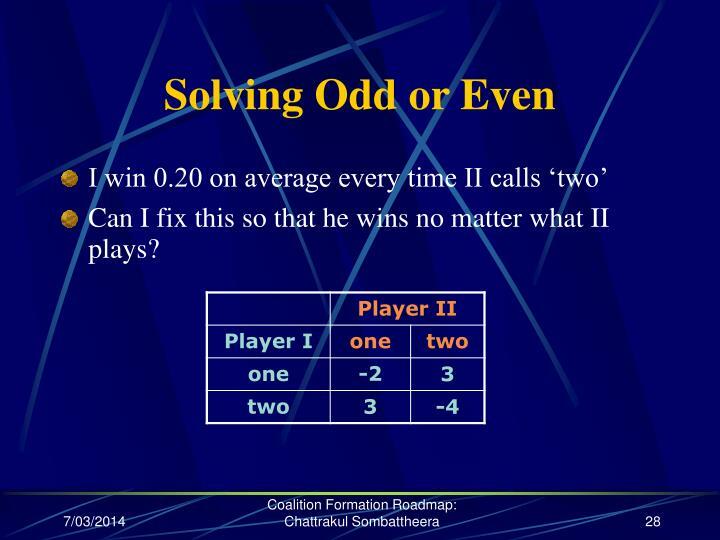 Can I fix this so that he wins no matter what II plays? 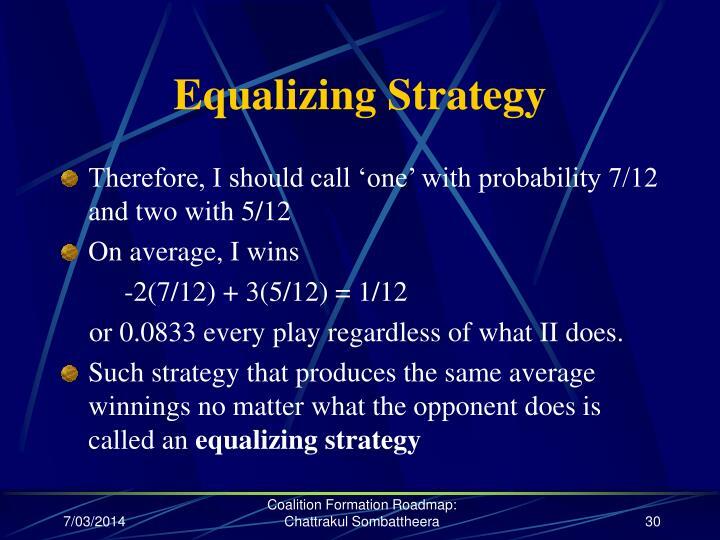 or 0.0833 every play regardless of what II does. 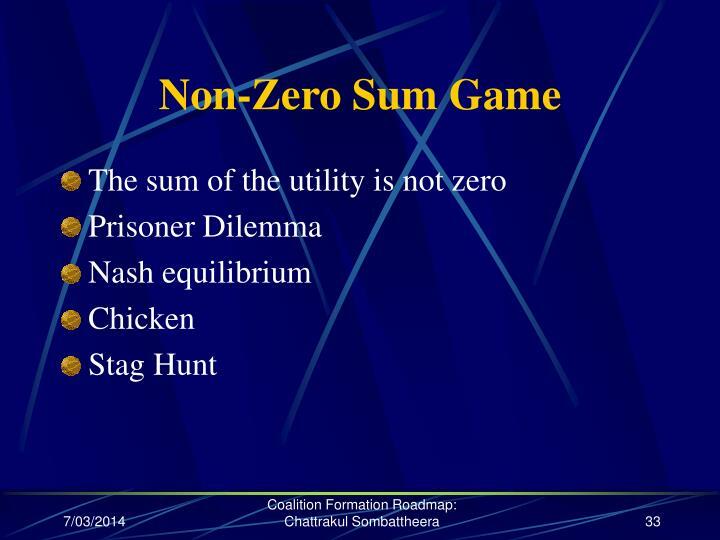 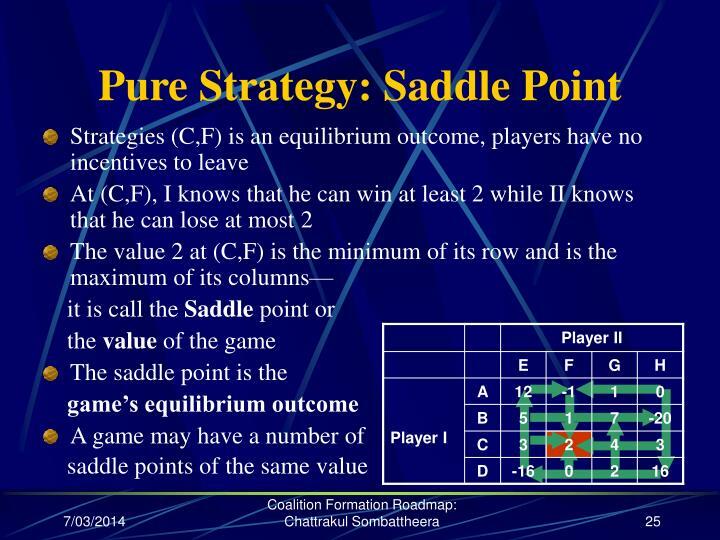 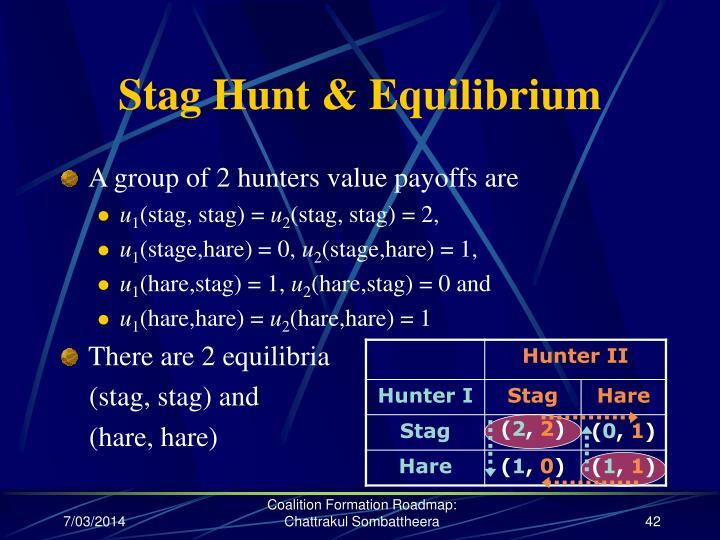 A two person zero sum game is finite if both strategy set Si and Sj are finite sets. 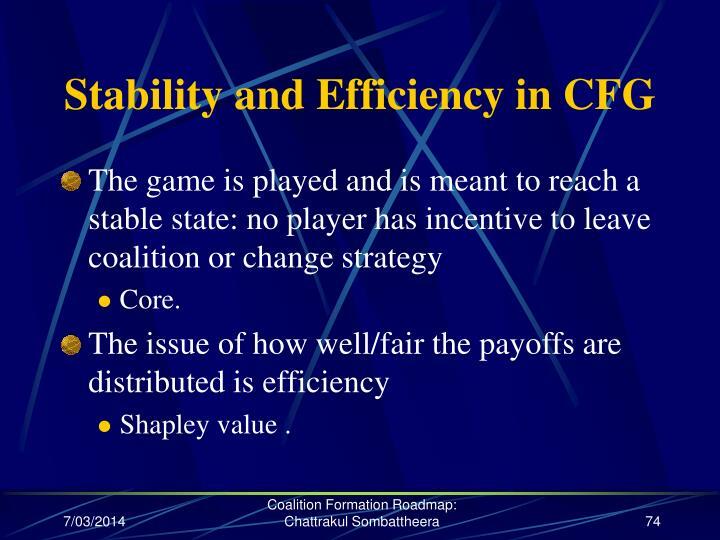 What should be the outcome of the game? 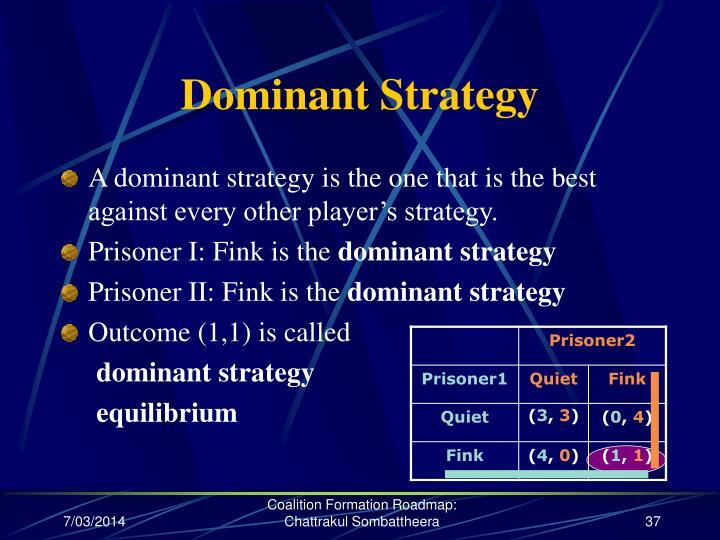 A dominant strategy is the one that is the best against every other player’s strategy. 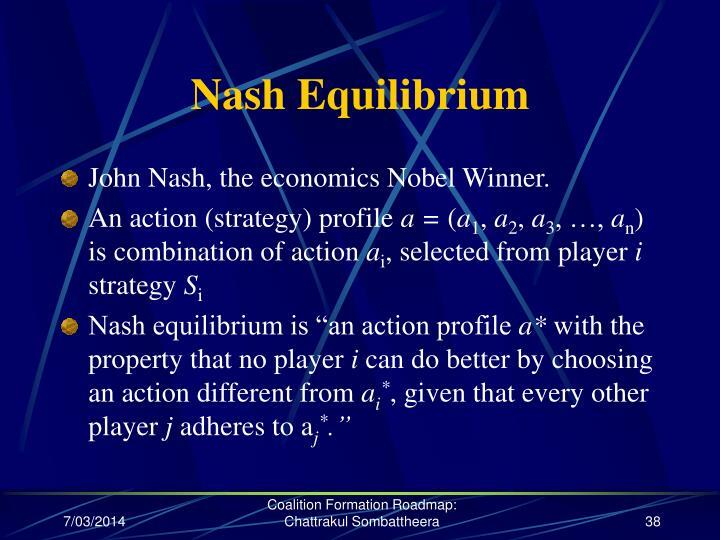 John Nash, the economics Nobel Winner. 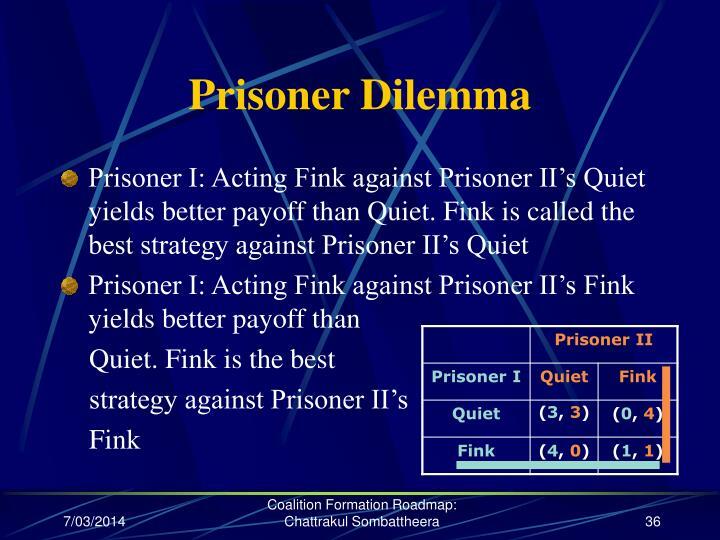 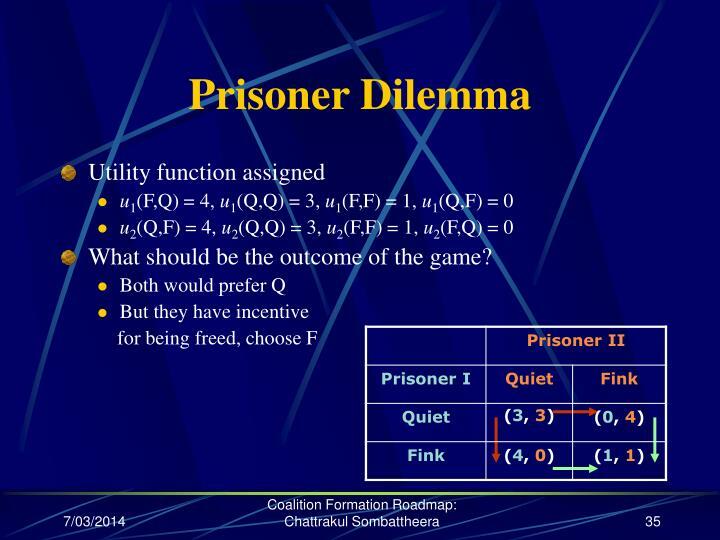 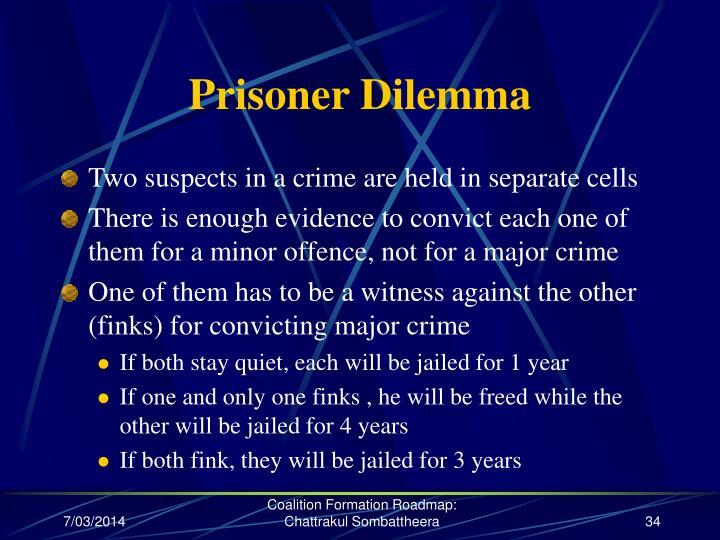 What is the equilibrium in Prisoner Dilemma? 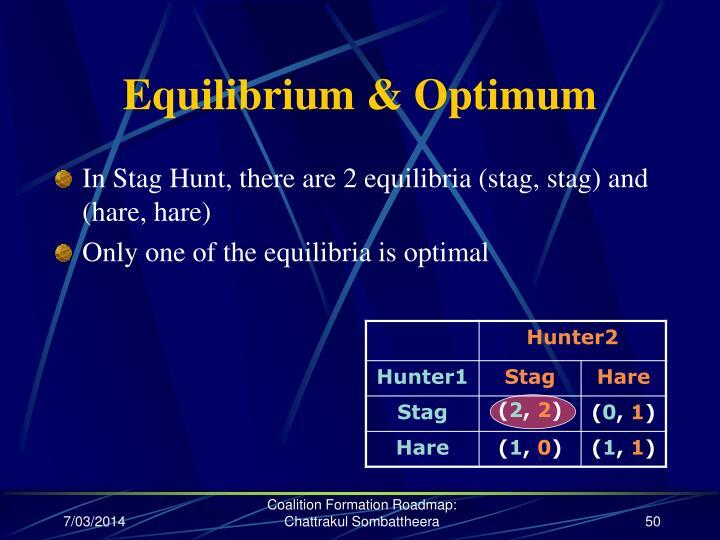 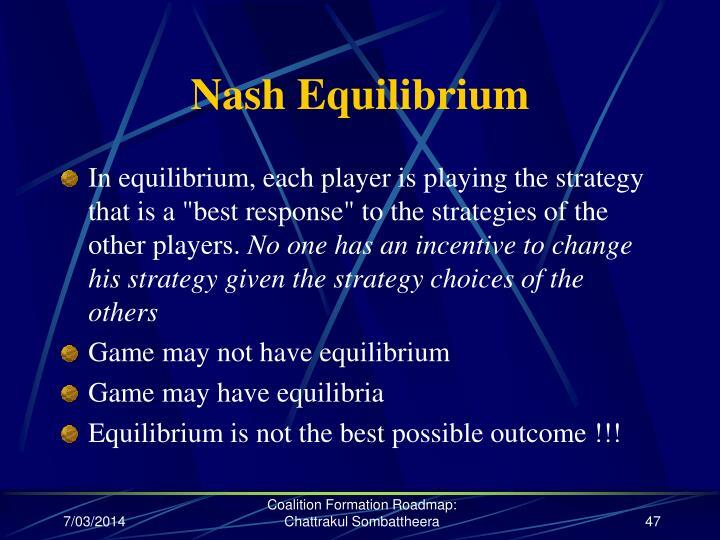 Equilibrium is not the best possible outcome !!! 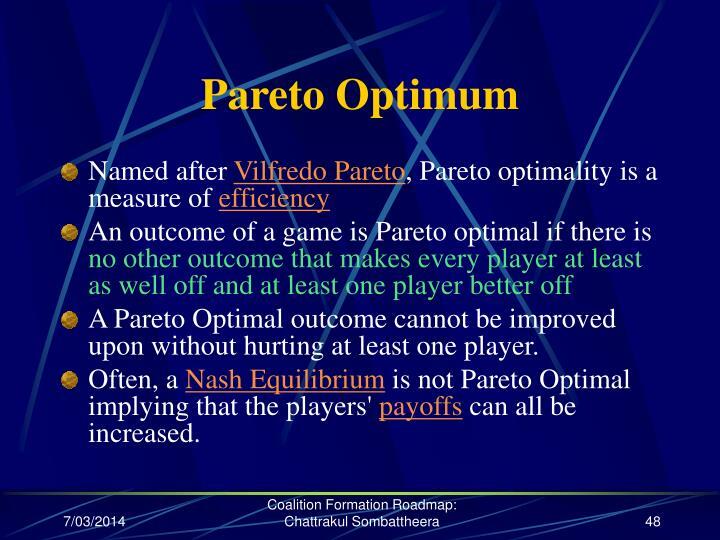 A Pareto Optimal outcome cannot be improved upon without hurting at least one player. 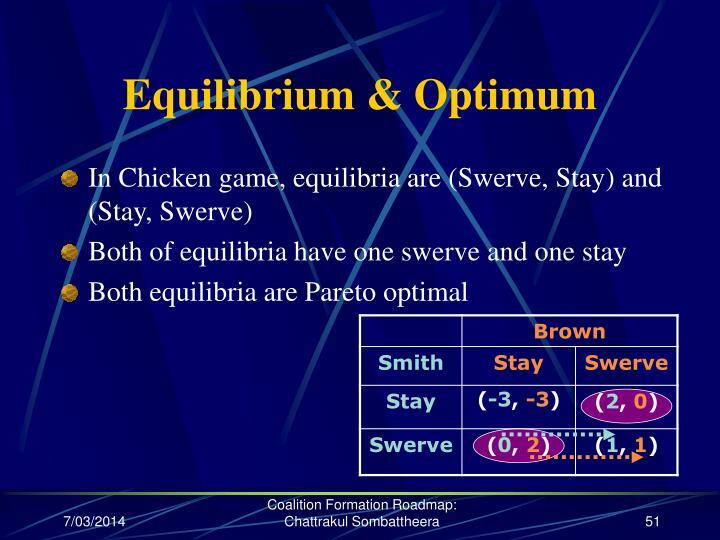 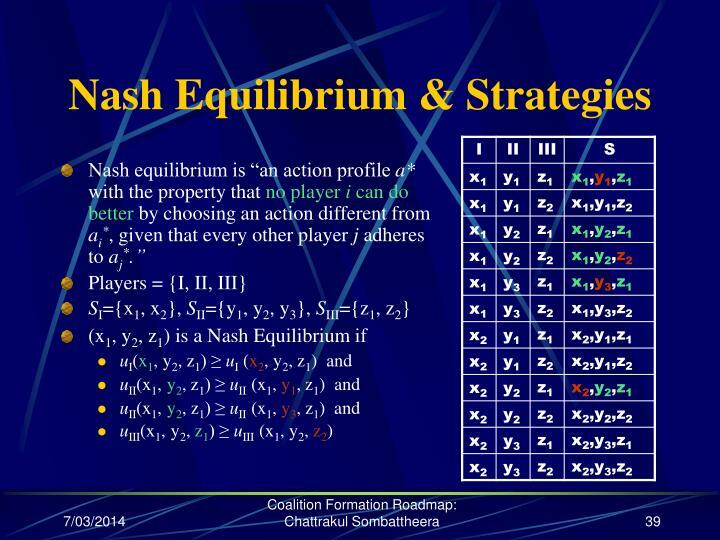 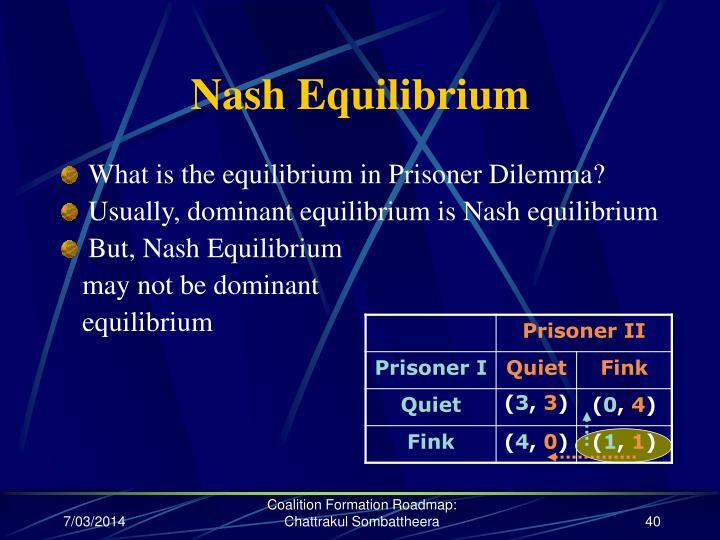 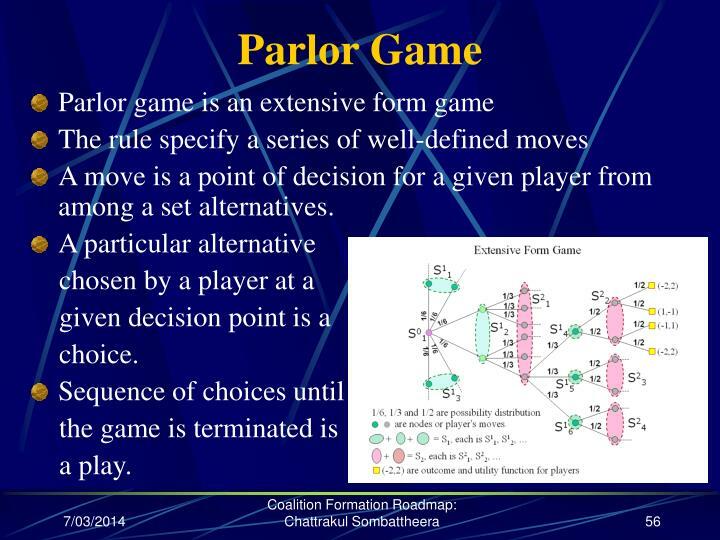 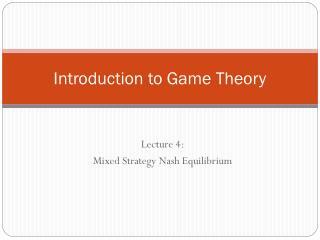 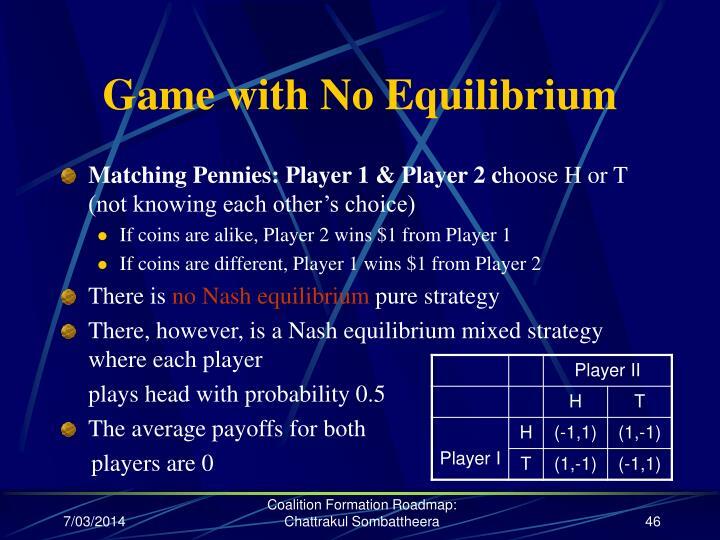 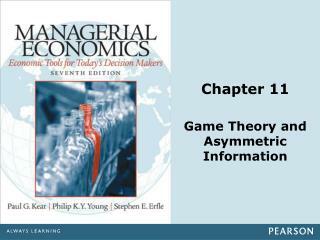 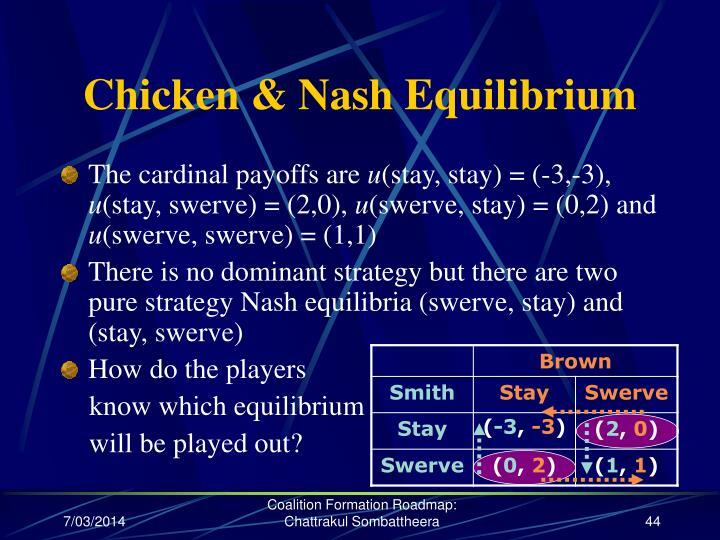 Often, a Nash Equilibrium is not Pareto Optimal implying that the players' payoffs can all be increased. 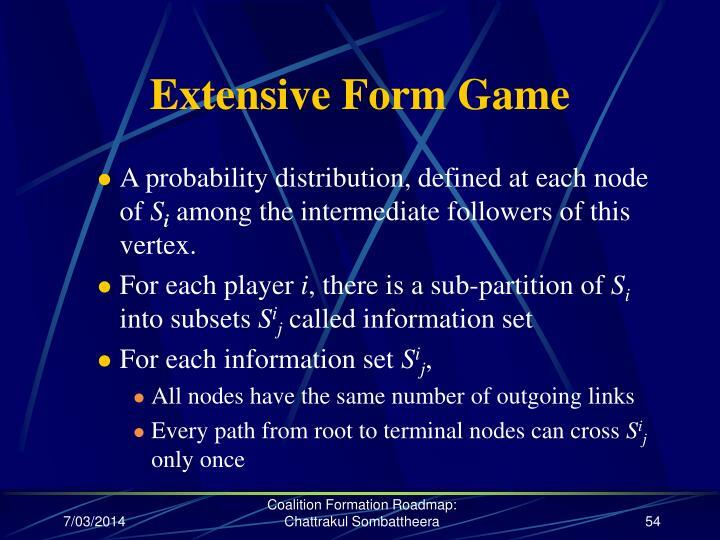 A probability distribution, defined at each node of Si among the intermediate followers of this vertex. 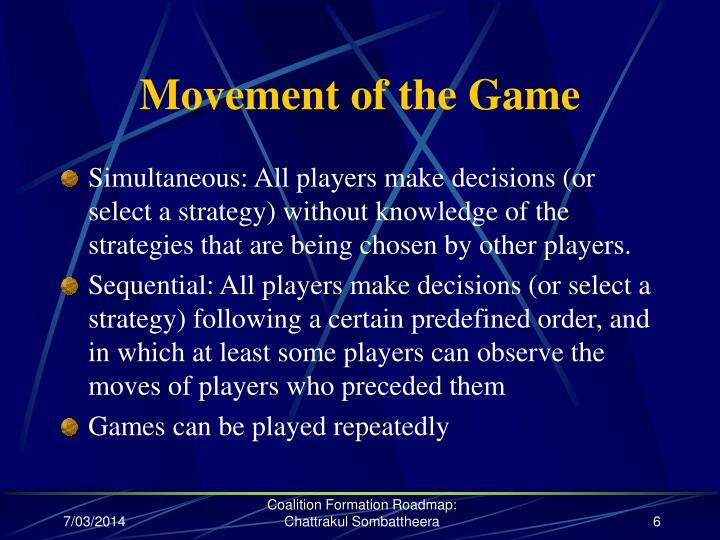 A move is a point of decision for a given player from among a set alternatives. 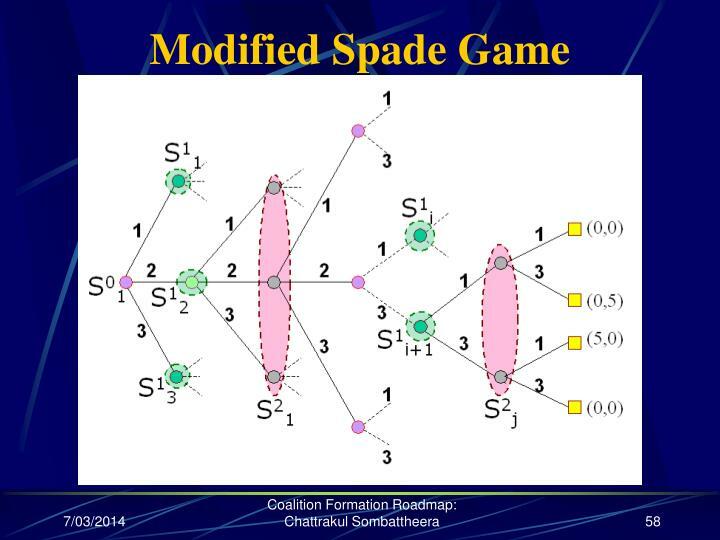 For simplicity, a set of cards are reduced to aces, 2s, and 3s. 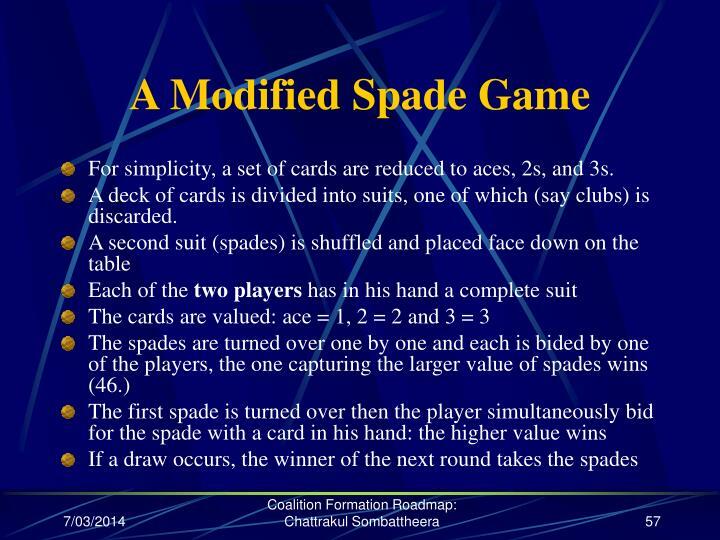 A deck of cards is divided into suits, one of which (say clubs) is discarded. 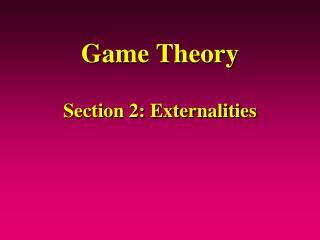 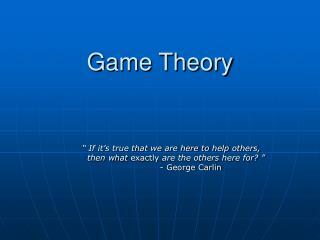 A game eventually terminates in an end-state i.e. 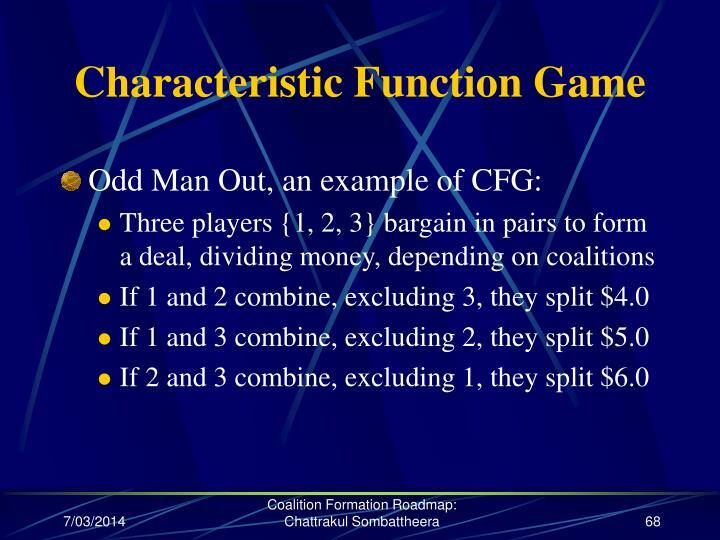 outcome or coalition structure. 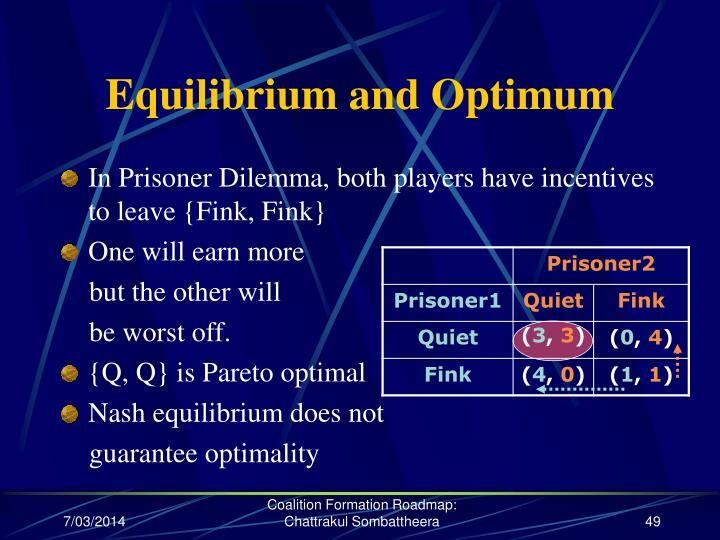 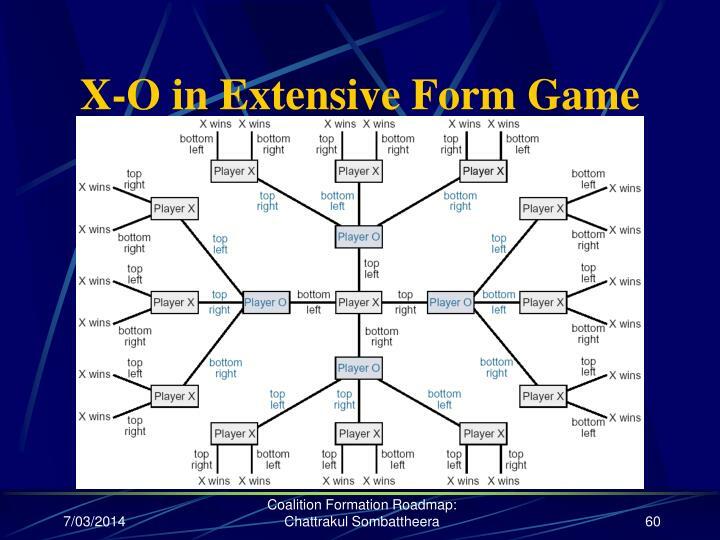 The quantitative representation of an outcome to a player is a payoff xi. 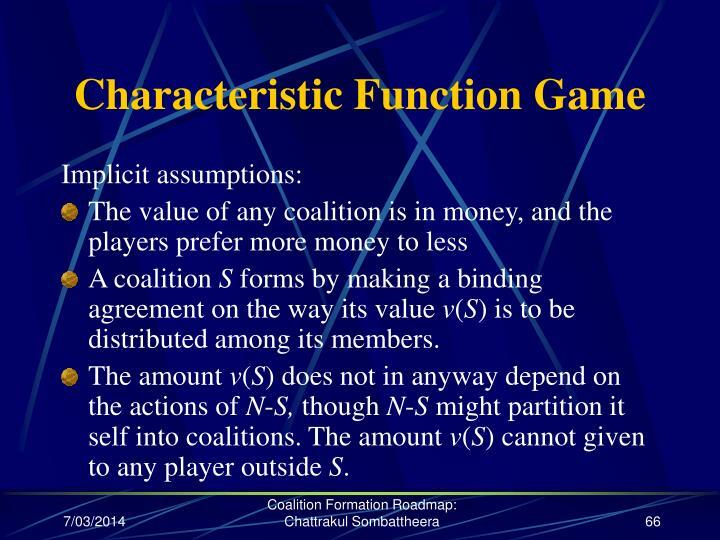 v : S → R is a characteristic function defining a real value to each coalition S of N.
A coalition S forms by making a binding agreement on the way its value v(S) is to be distributed among its members. 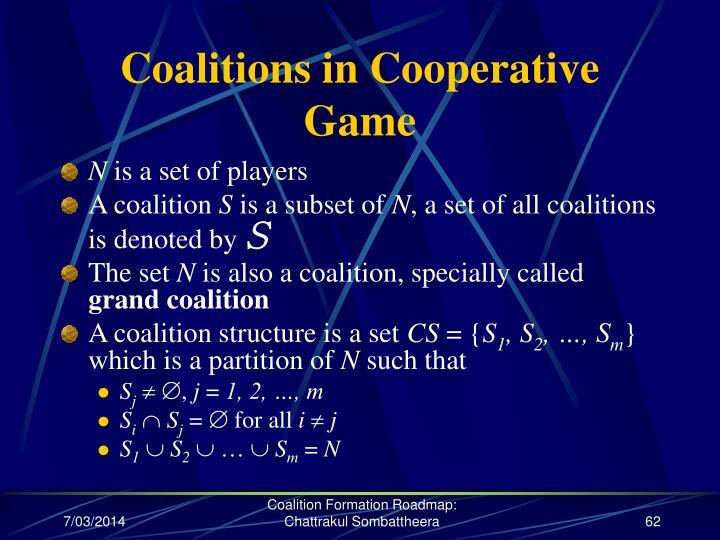 The amount v(S) does not in anyway depend on the actions of N-S, though N-S might partition it self into coalitions. 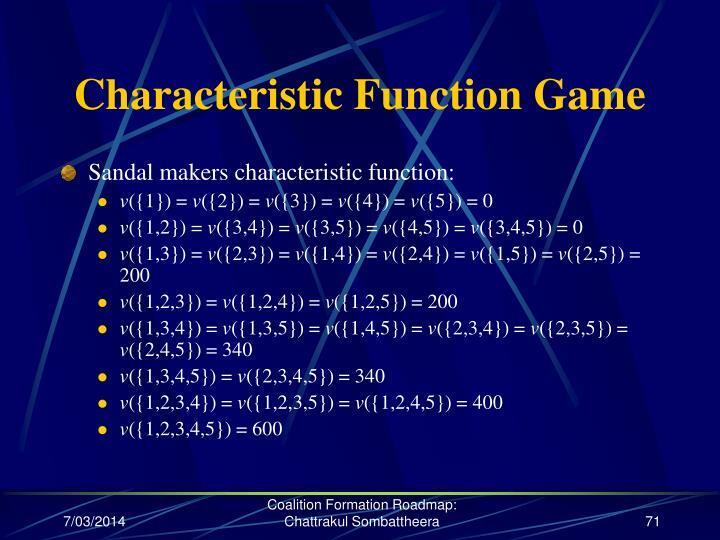 The amount v(S) cannot given to any player outside S.
The characteristic function v is known to all players. 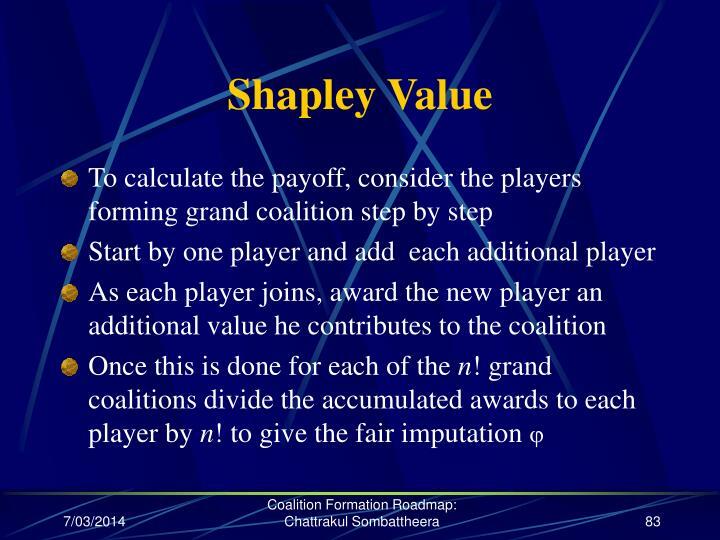 Any agreement concerning the formation and disbursement of value is known to all n players as soon as it is made. 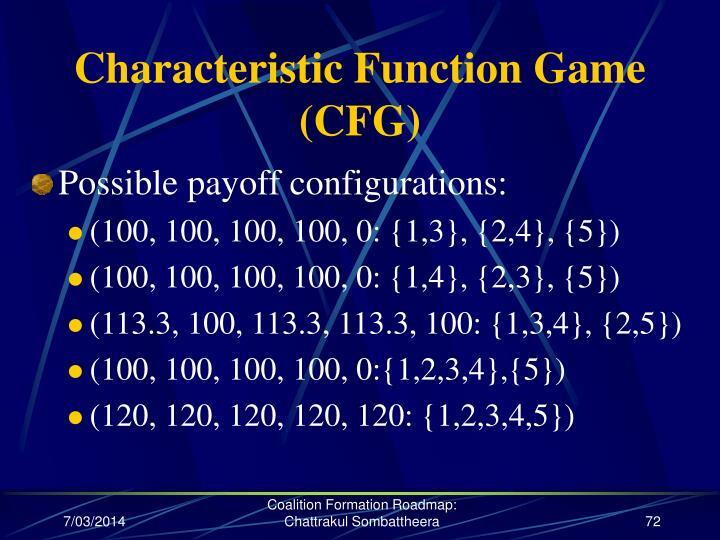 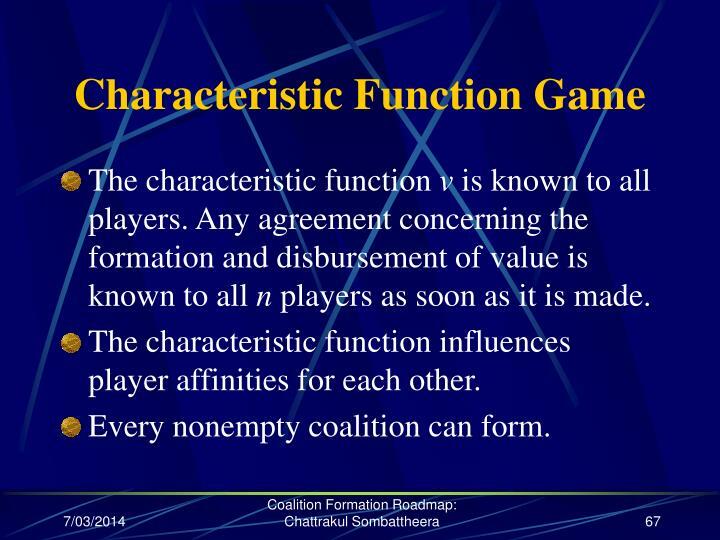 The characteristic function influences player affinities for each other. 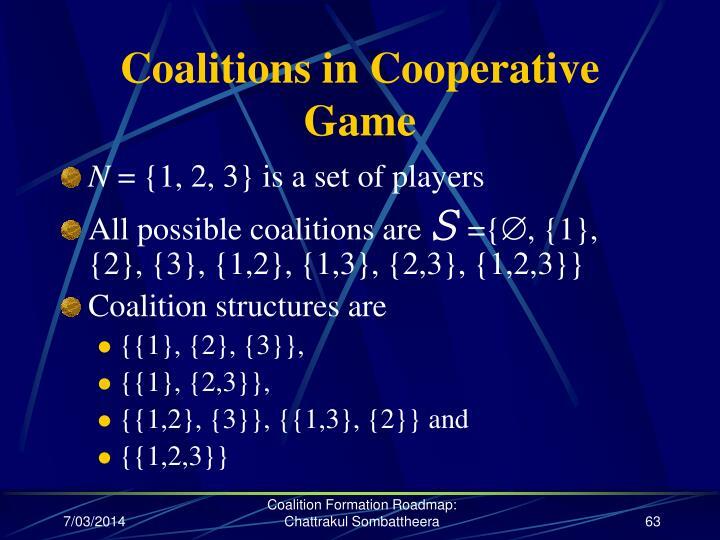 Every nonempty coalition can form. 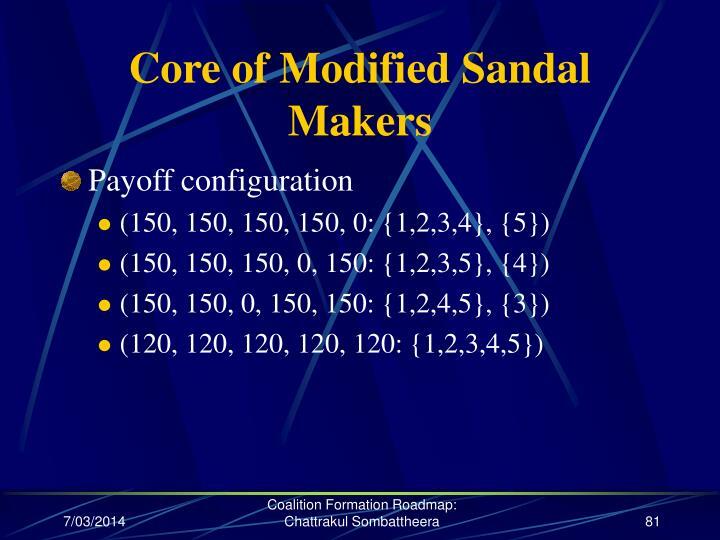 Any single sandal worth nothing while a pair (of left and right!) 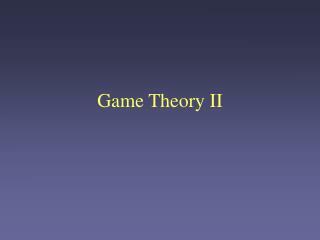 sells $20. 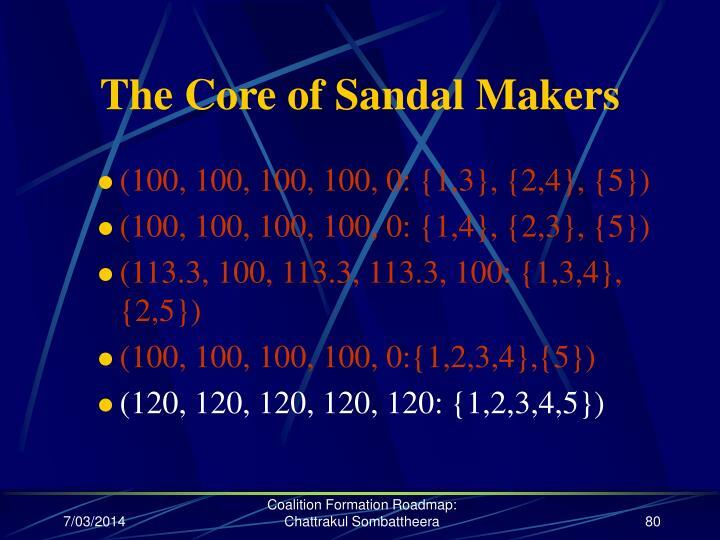 A coalition is a binding agreement between left and right sandal makers. 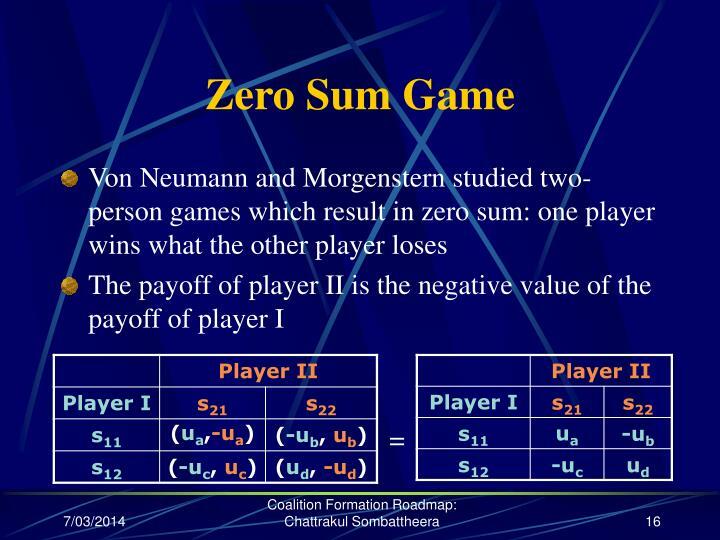 A game is super-additive if v(S  T)  v(S) + v(T) for all S, T  N such that S  T = Ø. 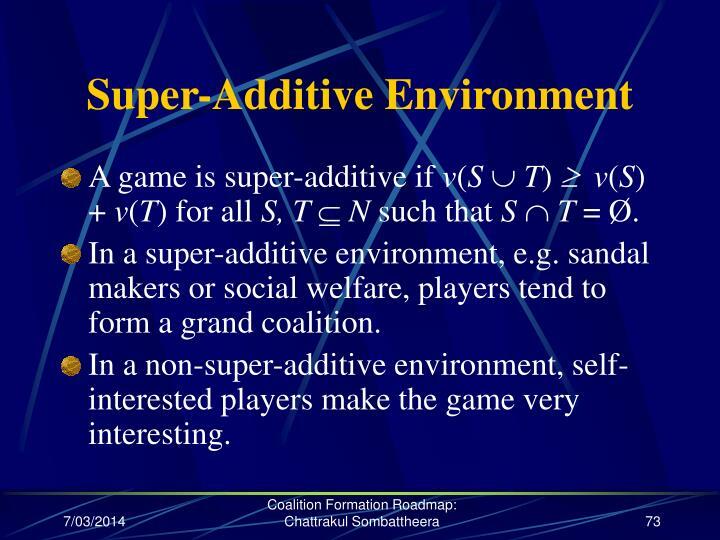 In a super-additive environment, e.g. 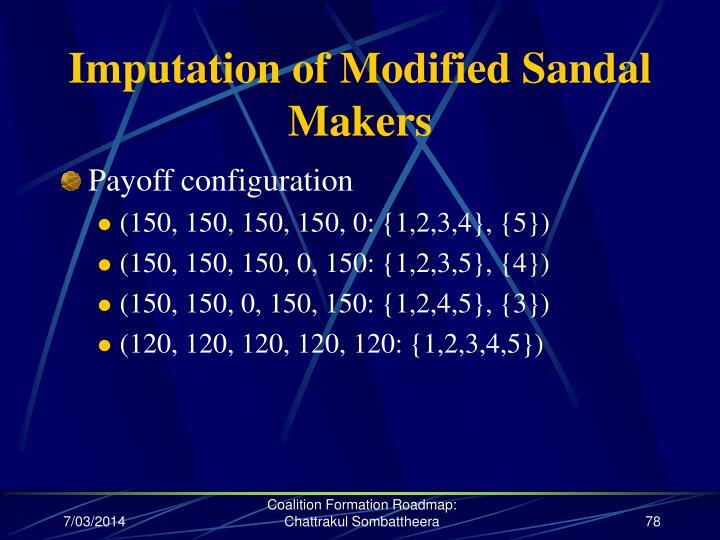 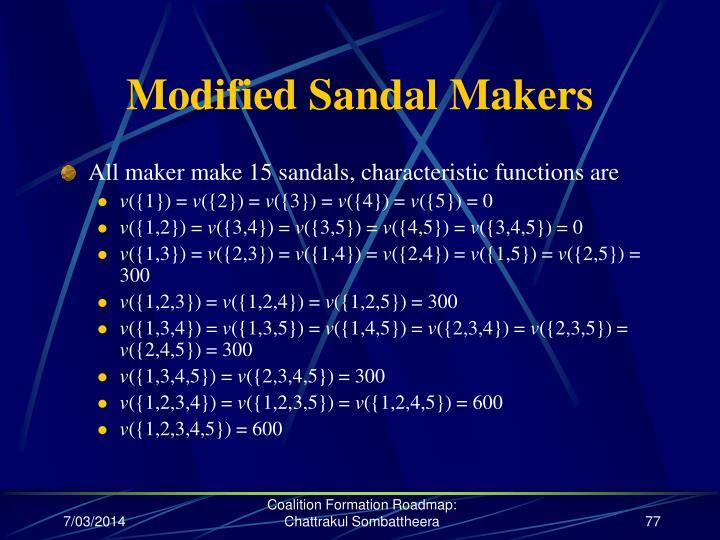 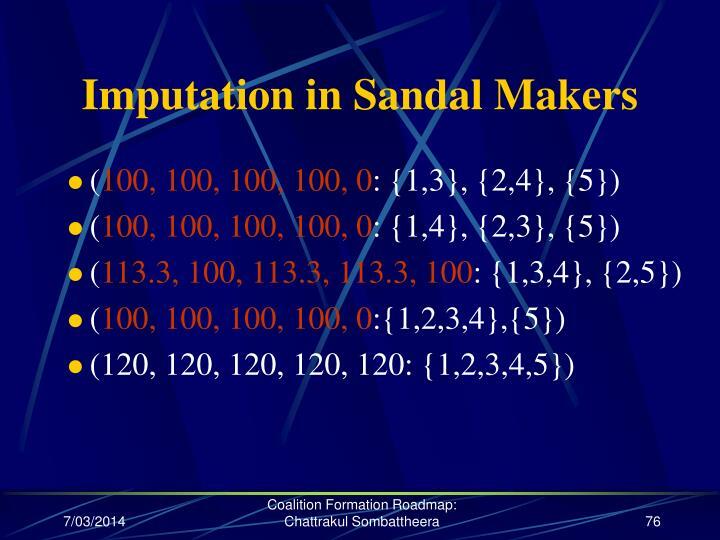 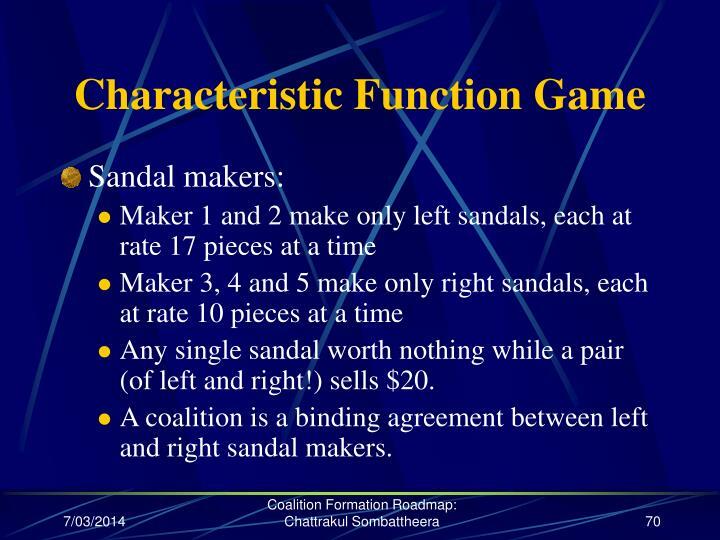 sandal makers or social welfare, players tend to form a grand coalition. 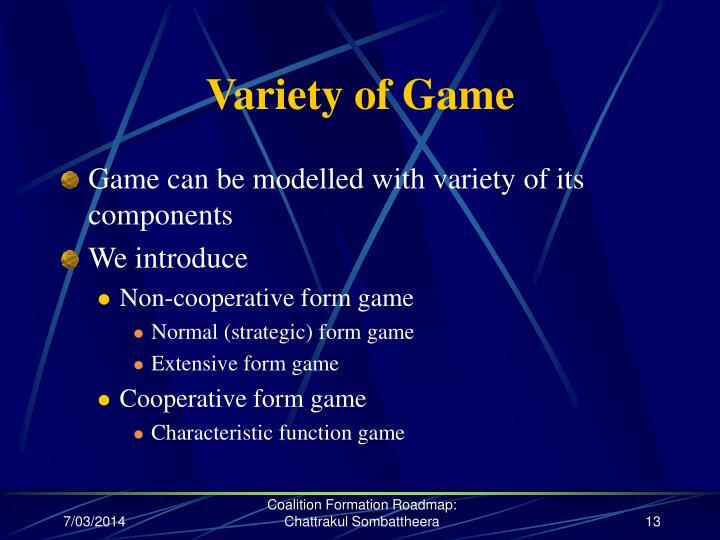 In a non-super-additive environment, self-interested players make the game very interesting. 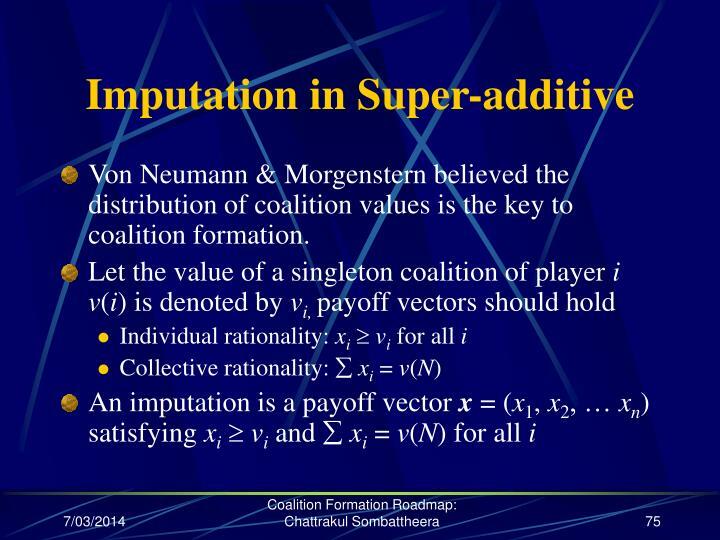 Von Neumann & Morgenstern believed the distribution of coalition values is the key to coalition formation. 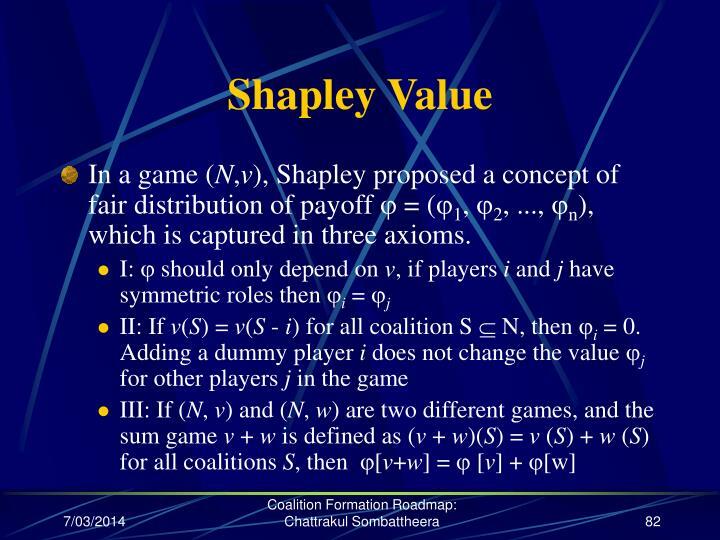 In a game (N,v), Shapley proposed a concept of fair distribution of payoff  = (1, 2, ..., n), which is captured in three axioms.